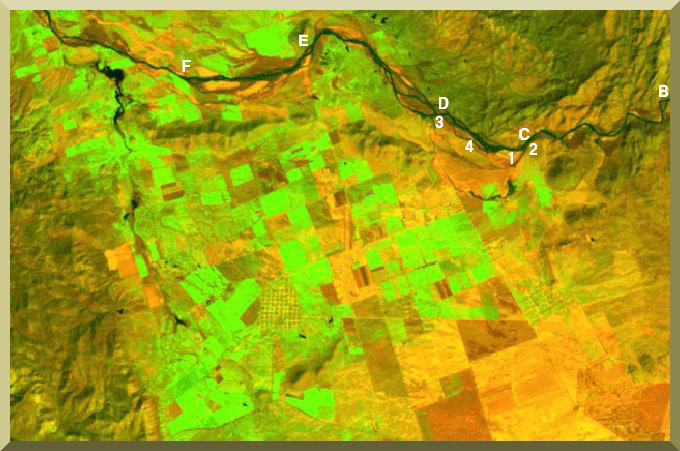 (a) Sand mining in El Barbon Wash, (b) A yellow nutsedge plant, and (c) Olive grove showing saucer basins to fight drought. 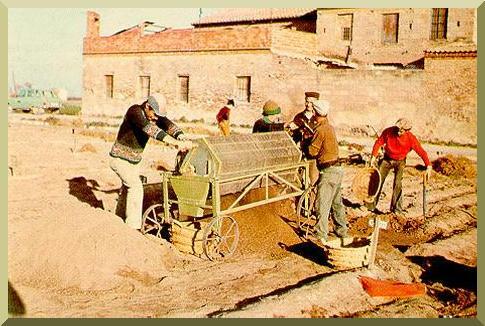 For thousands of years, sand and gravel have been used in the construction of roads and buildings. Today, demand for sand and gravel continues to increase. Mining operators, in conjunction with cognizant resource agencies, must work to ensure that sand mining is conducted in a responsible manner. Excessive instream sand-and-gravel mining causes the degradation of rivers. Instream mining lowers the stream bottom, which may lead to bank erosion. Depletion of sand in the streambed and along coastal areas causes the deepening of rivers and estuaries, and the enlargement of river mouths and coastal inlets. It may also lead to saline-water intrusion from the nearby sea. The effect of mining is compounded by the effect of sea level rise. Any volume of sand exported from streambeds and coastal areas is a loss to the system. Excessive instream sand mining is a threat to bridges, river banks and nearby structures. Sand mining also affects the adjoining groundwater system and the uses that local people make of the river. Instream sand mining results in the destruction of aquatic and riparian habitat through large changes in the channel morphology. Impacts include bed degradation, bed coarsening, lowered water tables near the streambed, and channel instability. These physical impacts cause degradation of riparian and aquatic biota and may lead to the undermining of bridges and other structures. Continued extraction may also cause the entire streambed to degrade to the depth of excavation. Sand mining generates extra vehicle traffic, which negatively impairs the environment. Where access roads cross riparian areas, the local environment may be impacted. Determining the sand budget for a particular stream reach requires site-specific topographic, hydrologic, and hydraulic information. This information is used to determine the amount of sand that can be removed from the area without causing undue erosion or degradation, either at the site or at a nearby location, upstream or downstream. 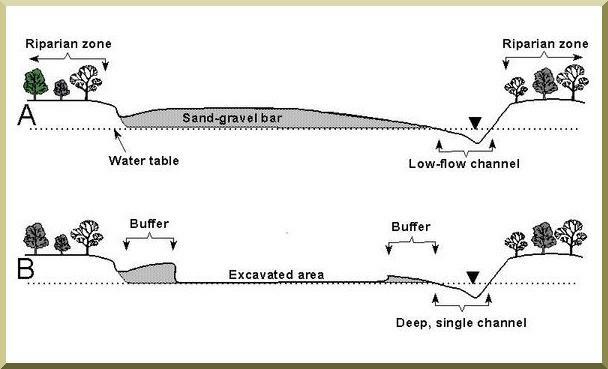 In-channel or near-channel sand-and-gravel mining changes the sediment budget, and may result in subtantial changes in the channel hydraulics. These interventions can have variable effects on aquatic habitat, depending on the magnitude and frequency of the disturbance, mining methods, particle-size characteristics of the sediment, the characteristics of riparian vegetation, and the magnitude and frequency of hydrologic events following the disturbance. Temporal and spatial responses of alluvial river systems are a function of geomorphic thresholds, feedbacks, lags, upstream or downstream transmission of disturbances, and geologic/physiographic controls. Minimization of the negative effects of sand-and-gravel mining requires a detailed understanding of the response of the channel to mining disturbances. Decisions on where to mine, how much and how often require the definition of a reference state, i.e., a minimally acceptable or agreed-upon physical and biological condition of the channel. Present understanding of alluvial systems is generally not sufficient to enable the prediction of channel responses quantitatively and with confidence; therefore, reference states are difficult to determine. Still, a general knowledge of fluvial processes can provide guidelines to minimize the detrimental effects of mining. Well-documented cases and related field data are required to properly assess physical, biological,and economic tradeoffs. Instream mining can have other costly effects beyond the immediate mine sites. Many hectares of fertile streamside land are lost annually, as well as valuable timber resources and wildlife habitats in the riparian areas. Degraded stream habitats result in lost of fisheries productivity, biodiversity, and recreational potential. Severely degraded channels may lower land and aesthetic values. All species require specific habitat conditions to ensure long-term survival. Native species in streams are uniquely adapted to the habitat conditions that existed before humans began large-scale alterations. These have caused major habitat disruptions that favored some species over others and caused overall declines in biological diversity and productivity. In most streams and rivers, habitat quality is strongly linked to the stability of channel bed and banks. Unstable stream channels are inhospitable to most aquatic species. Factors that increase or decrease sediment supply often destabilize bed and banks and result in dramatic channel readjustments. For example, human activities that accelerate stream bank erosion, such as riparian forest clearing or instream mining, cause stream banks to become net sources of sediment that often have severe consequences for aquatic species. Anthropogenic activities that artificially lower stream bed elevation cause bed instabilities that result in a net release of sediment in the local vicinity. Unstable sediments simplify and, therefore, degrade stream habitats for many aquatic species. Few species benefit from these effects. The most important effects of instream sand mining on aquatic habitats are bed degradation and sedimentation, which can have substantial negative effects on aquatic life. The stability of sand-bed and gravel-bed streams depends on a delicate balance between streamflow, sediment supplied from the watershed, and channel form. Mining-induced changes in sediment supply and channel form disrupt channel and habitat development processes. Furthermore, movement of unstable substrates results in downstream sedimentation of habitats. The affected distance depends on the intensity of mining, particles sizes, stream flows, and channel morphology. 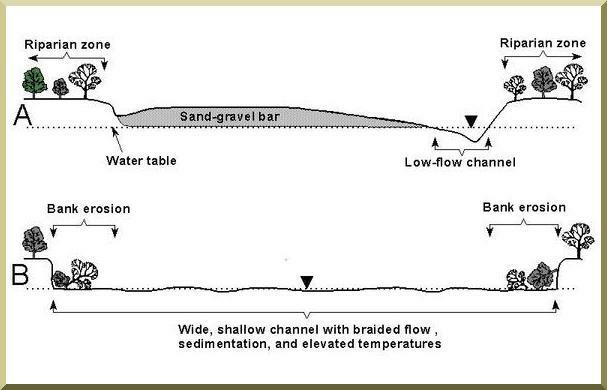 Channel widening causes shallowing of the streambed, producing braided flow or subsurface intergravel flow in riffle areas, hindering movement of fishes between pools. Channel reaches become more uniformly shallow as deep pools fill with gravel and other sediments, reducing habitat complexity, riffle-pool structure, and numbers of large predatory fishes. Sand-and-gravel mining in stream channels can damage public and private property. Channel incision caused by gravel mining can undermine bridge piers and expose buried pipelines and other infrastructure. Several studies have documented the bed degradation caused by the two general forms of instream mining: (1) pit excavation and (2) bar skimming. Bed degradation, also known as channel incision, occurs through two primary processes: (1) headcutting, and (2) "hungry" water. In headcutting, excavation of a mining pit in the active channel lowers the stream bed, creating a nick point that locally steepens channel slope and increases flow energy. During high flows, a nick point becomes a location of bed erosion that gradually moves upstream (Fig. 1). Fig. 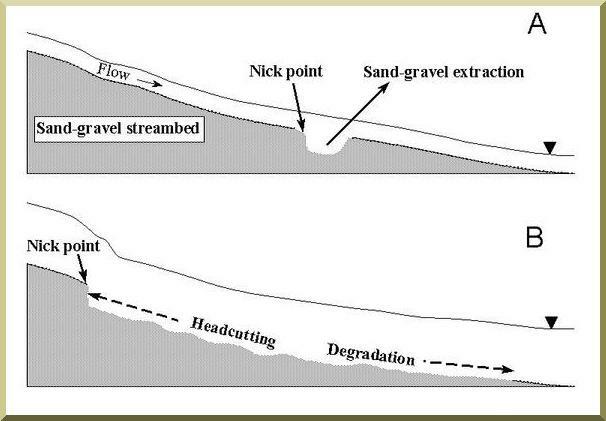 1 Diagram of sand-and-gravel stream bed showing (A) the nick point that develops with a pit excavation, and (B) the upstream head cutting and downstream bed degradation that develop during high flows. Headcutting mobilizes substantial quantities of streambed sediments which are then transported downstream to deposit in the excavated area and locations further downstream. In gravel-rich streams, effects downstream of mining sites may be short-lived when mining ends, because the balance between sediment input and transport at a site can reestablish itself relatively quickly. Effects in gravel-poor streams may develop rapidly and persist for many years after mining has finished. Regardless of downstream effects, headcutting in both gravel-rich and gravel-poor streams remains a major concern. Headcuts often move long distances upstream and into tributaries, in some watersheds moving as far as the headwaters or until halted by geologic controls or man-made structures. A second form of bed degradation occurs when mineral extraction increases the flow capacity of the channel. A pit excavation locally increases flow depth (Fig. 1) and a barskimming operation increases flow width (Fig. 2). Both conditions produce slower streamflow velocities and lower flow energies, causing sediments arriving from upstream to deposit at the mining site. As streamflow moves beyond the site and flow energies increase in response to the "normal" channel form downstream, the amount of transported sediment leaving the site is now less than the sediment carrying capacity of the flow. This sediment-deficient flow or "hungry" water picks up more sediment from the stream reach below the mining site, furthering the bed degradation process (Fig. 1). This condition continues until the equilibrium between input and output of sediments at the site is reestablished. Fig. 2 Diagram of channel cross sections showing (A) a typical sand-gravel bar in relation to the low-flow channel, riparian zone and water table, and (B) the wide shallow channel that results from unrestricted mining and that is characterized by bank erosion, braided flow, sedimentation, and increased water temperatures. A similar effect occurs below dams, which trap sediment and release "hungry" water downstream, where channel incision usually ensues. Instream mineral excavation downstream of dams compounds this problem. Although other factors such as levees, bank protection, and altered flow regimes also promote channel incision, mineral extraction rates in many streams are often orders-of-magnitude in excess of sediment supply from the watershed, suggesting that extraction is largely responsible for observed channel changes. Susceptibility to hungry-water effects would depend on the rate of extraction relative to the rate of replenishment. Gravel-poor streams would be most susceptible to disturbance. 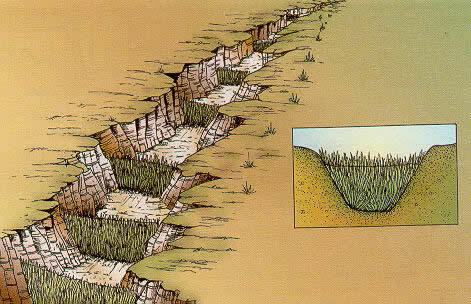 Channel incision not only causes vertical instability in the channel bed, but also causes lateral instability in the form of accelerated stream bank erosion and channel widening. Incision increases stream bank heights, resulting in bank failure when the mechanical properties of the bank material cannot sustain the material weight. Channel widening causes shallowing of the streambed (Fig. 2) as deep pools fill with gravel and other sediments. Shallowing and widening of the channel also increases stream temperature extremes, and channel instability increases transport of sediments downstream. Mining-induced bed degradation and other channel changes may not develop for several years until major channel-adjustment flows occur, and adjustments may continue long after extraction has ended. Apart from threatening bridges, sand mining transforms the riverbeds into large and deep pits; as a result, the groundwater table drops leaving the drinking water wells on the embankments of these rivers dry. Bed degradation from instream mining lowers the elevation of streamflow and the floodplain water table which in turn can eliminate water table-dependent woody vegetation in riparian areas, and decrease wetted periods in riparian wetlands. For locations close to the sea, saline water may intrude into the fresh waterbody. Instream sand mining activities will have an impact upon the river's water quality. Impacts include increased short-term turbidity at the mining site due to resuspension of sediment, sedimentation due to stockpiling and dumping of excess mining materials and organic particulate matter, and oil spills or leakage from excavation machinery and transportation vehicles. Increased riverbed and bank erosion increases suspended solids in the water at the excavation site and downstream. Suspended solids may adversely affect water users and aquatic ecosystems. The impact is particularly significant if water users downstream of the site are abstracting water for domestic use. Suspended solids can significantly increase water treatment costs. The large-scale extraction of streambed materials, mining and dredging below the existing streambed, and the alteration of channel-bed form and shape leads to several impacts such as erosion of channel bed and banks, increase in channel slope, and change in channel morphology. These impacts may cause: (1) the undercutting and collapse of river banks, (2) the loss of adjacent land and/or structures, (3) upstream erosion as a result of an increase in channel slope and changes in flow velocity, and (4) downstream erosion due to increased carrying capacity of the stream, downstream changes in patterns of deposition, and changes in channel bed and habitat type. Mining and dredging activities, poorly planned stockpiling and uncontrolled dumping of overburden, and chemical/fuel spills will cause reduced water quality for downstream users, increased cost for downstream water treatment plants and poisoning of aquatic life. Mining which leads to the removal of channel substrate, resuspension of streambed sediment, clearance of vegetation, and stockpiling on the streambed, will have ecological impacts. These impacts may have an effect on the direct loss of stream reserve habitat, disturbances of species attached to streambed deposits, reduced light penetration, reduced primary production, and reduced feeding opportunities. 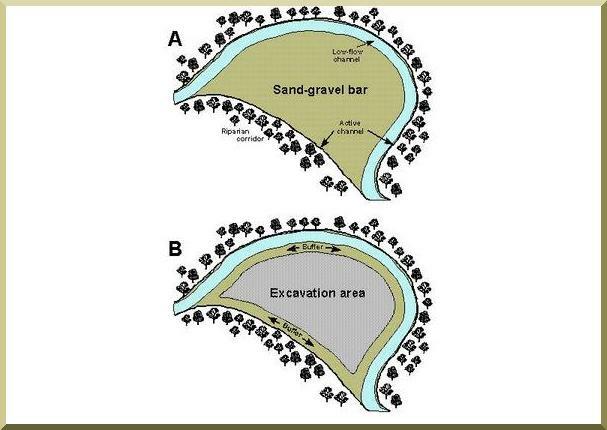 Figure 3 shows the mining of a sand-gravel bar in which the excavated area is limited to depths above the water table and buffer zones protect the deep single channel and channel banks. when mining is restricted within a buffer of designated width and above the watertable. Two minimum-width buffers should separate the excavation area (extraction site) from the low-flow channel and the adjacent channel bank (Fig. 4). These buffers lessen the risk of mining-induced headcuts; however, "hungry" water can still lead to channel incision downstream. Bar skimming can also cause other problems such as elimination of side channels, abrupt relocation of the low-flow channel, and higher mobility of loosened sediments. Gravel-rich streams are less susceptible than gravel-poor streams to disturbance from bar skimming. This is because replenishment by excess gravel from upstream sources would partially mitigate channel disruption. Mining of bars in gravel-rich streams should be preferred over mining in gravel-poor streams. Reaches that receive high rates of deposits may be better locations for mining than reaches that do not. and (B) the area of excavation defined by a no-disturbance buffer of designated width. 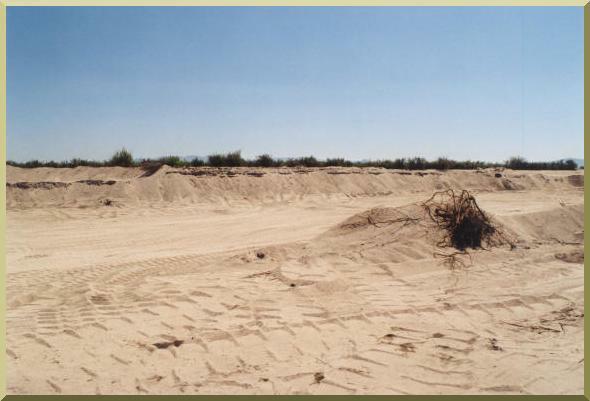 Excavation of sand or gravel deposits should be limited to unconsolidated areas containing primarily smaller material (at least 85% of material is less than 3 in in diameter) that is loosely packed; the material should not contain any woody perennial vegetation greater than 1-in diameter. A 20-ft wide undisturbed buffer should be maintained between the removal area and the water line at the time of excavation, and between the removal area and adjacent bank. A 25-ft wide streamside riparian corridor should be maintained in an undisturbed condition landward of the high bank for the length of the sand-and-gravel removal site; disturbed areas in this riparian zone shall be limited to access roads. Sand or gravel should not be excavated below the elevation of the water table at the time of removal. If the stream is dry, the excavation must not proceed beyond the lowest undisturbed elevation of the stream bottom, which is a function of local hydraulics, hydrology, and geomorphology. Established water conveyance channels should not be relocated, straightened, or modified. Sandmining from streambeds in the U.S. is regulated by the U.S. Army Corps of Engineers under Section 404 of the Clean Water Act (U.S. Code of Federal Regulations, Title 33, Chapter 26, Subchapter IV, Section 1344: Permits for dredged or fill material). Under this legislation, the government is authorized to deny or restrict the specification of any defined area as a disposal site, whenever it is determined, after notice and opportunity for public hearings, that the discharge of dredged or fill materials into such area will have an unacceptable adverse effect on municipal water supplies, shellfish beds and fishery areas (including spawning and breeding areas), wildlife, or recreational areas. The government is authorized to issue permits for any category of activities involving discharges of dredged or fill material if the activities will cause only minimal adverse environmental effects when performed separately, and will have only minimal cumulative adverse effect of the environment. The government may also issue permits for any discharge or fill material into the navigable waters incidental to any activity having as its purpose bringing an area of the navigable waters into a use to which it was not previously subject, where the flow or circulation of navigable waters may be impared or the reach of such waters be reduced. Section 404 is strictly applicable to discharge of dredged or fill materials into navigable waters. However, the Code is actively being used to regulate sandmining activities in arroyos and washes of the Western United States. Thus, the government issues permits to sandmining operators in order to comply with the requirements of the Code, specifically, the avoidance of adverse effects on municipal water supplies, fisheries, wildlife, or recreation. The U.S. Fish and Wildlife Service regulates sandmining operations under the Endangered Species Act of 1973 (Section 9: Prohibited Acts). Under item 2(B) of Section 9, it is unlawful for any person subjected to the jurisdiction of the United States to remove and reduce to possession any endangered species of plants listed in Section 4, from areas under Federal jurisdiction; to maliciously damage or destroy any such species on any such area; or to remove, cut, dig up, or damage or destroy any species on any other area in knowing violation of any law or regulation of any state. This regulation is used by the Federal government to restrict sandmining operations in the Western United States. Sand mining in Southern California has undergone substantial changes in the past few years. Environmental regulations have discouraged operators from continuing to mine U.S. streambeds. Increasingly, sand-mining operators are finding it more cost effective to import the sand from south of the border. For example, out of eleven operators in the San Luis Rey river, in San Diego County, about 10 years ago, only two remain in business at the present time. In Los Angeles County, the annual consumption of aggregate sand is about 9 million tons; in San Diego County it is about 3.5 million tons. In the past few years, the cost of construction-grade sand in Southern California has increased from $6.50 to $12.00 per ton ($4.64 to $8.57 per m3). This increase is directly linked to the prevailing regulatory environment, which effectively discourages the mining of sand from local streambeds. The high cost of sand and the relative proximity of the Mexican streambeds makes it economically feasible to import sand from south of the border. In the past 6 years, the percentage of sand used in San Diego County and originating in Baja California has increased steadily, from close to zero to nearly 40% at present. The U.S. Army Corps of Engineers requires a 404 permit (Clean Water Act: Discharge of dredged or fill material into navigable waters) in order to operate a riverine sand-borrow pit. The U.S. Fish and Wildlife Service and the California Department of Fish and Game require operators to obtain "take" permits to remove habitat or endangered species. This requirement limits the ability of operators to continue mining streambeds in Southern California. Thus, this sets the pattern for sand mining elsewhere, particularly Baja California, which is close enough, and where current regulations are not as stringent as in California. El Barbon Wash (Ponce, et al.1999) is the main streambed in the vicinity of the Ojos Negros valley (Fig. 6). Sand is currently being mined in El Barbon Wash (Fig. 7) by authorized operators. The current pit has aproximate dimensions of 1800 m length by 200 m width and 2.3 m depth, which amounts to 828,000 cubic meters, or 1.2 million tons, in the past two years. The extracted material is construction-grade sand. 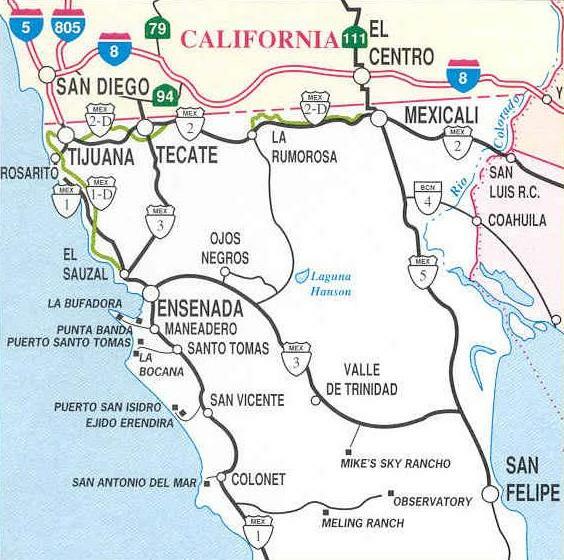 It is transported by trucks to Ensenada, where it is shipped in barges to destinations in Southern California. The sand is being used mostly as an aggregate for cement and asphaltic concrete. Fig. 6 Geographical location of the Ojos Negros Valley, Baja California, Mexico. Extractable volumes should be limited to those that can be replenished with normal hydraulic transport from the upstream basin. In addition, extraction should concentrate on deposition reaches, if any. There is a possibility for upstream headcutting and downstream degradation, which can lead to bank failure and stream widening. In El Barbon Wash, the downstream degradation will depend on the extent to which the canyon downstream of Real del Castillo Viejo (Fig. 8) is acting as a control on the upstream riverbed. No impacts are expected to stream fauna, which is negligible. The impacts to stream flora will depend on the extent to which riparian areas are affected by the mining operations. The flora observed in El Barbon Wash and vicinity include the following: Baccharis sarathroides (Hierba del pasmo), Baccharis glutinosa (Guatamote o batamote), Chilopsis linearis (Mimbre), Chrysanthemun leucanthemum, Clematis lasianatha (Barbas de chivo), Clematis pauciflora, Dasylirion wheeleri, Ferocactus acanthodes, Haplopappus sonorensis (Romerillo amargo), Heteromeles arbutifolia (Toyon), Lathyrus laetiflorus, Linanthus sp., Lonicera subspicata, Pluchea sericea (Cachanilla), Rhus ovata (Lentisco), Rhus diversiloba, Ribes malvastrum, Ribes viburnifolium, Salvia columbariae (Salvia), Salvia pachyphylla (Salvia rosa), Salvia vaseyi, Tamarix pentandra (Pino salado), and Yucca whipplei. There are no bridges in the vicinity of El Barbon Wash. Therefore, impact to structures will be limited to the existing concrete ford. Excavation may lead to channel degradation, which may negatively affect concrete ford stability. Impacts to local groundwater resources will depend on whether the excavation reaches the water table. The depth to the water table at El Barbon Wash has not been measured; in addition, it is subject to seasonal and annual fluctuation. The mining excavation should be restricted to depths well above the water table; otherwise, there is a risk of water loss by evaporation and surface runoff, which may negatively impact local water resources. Impacts to local landscaping and riparian habitat will depend on the extent to which the mining operation changes the natural landscape to fulfill its objectives. Impacts to surface water quality are expected to be negligible as long as mining is accomplished on dry washes. Impacts to groundwater quality will depend on the extent to which the mining operation results in spills of gasoline, oil, and other chemicals, which may eventually reach the water table. Increased noise and dust will depend directly on the volume of mining. Permissible noise levels are summarized in Table 4. The current mining encompasses areas of streambeds and compromises adjacent riparian areas. These areas have not been declared as "national property," "federal zones," or have been properly delimited. Therefore, they remain as part of the individual parcels of the ejidos and private properties. Access to the mining areas is through ejido land, and this leads to potential conflicts with local proprietors. The unprecedented export of large volumes of construction-grade sand to the United States has affected the local economy in many ways. Since export began more than 2 years ago, the cost of sand in Ensenada has increased markedly, from $40 mexican pesos per cubic meter prior to the export, to the current cost of $100 mexican pesos. This has increased the cost of construction and has led to higher housing costs. The export of sand has led to a scarcity of this construction material in the local and regional markets. In addition, the sand locally available is of poor quality; this has affected a host of industries that depended on this sand, particularly those that manufacture concrete-based products. The export of sand in large quantities jeopardizes the regional economy, since the extracted material is not readily replenishable. Therefore, current mining operations may lead to regional scarcity of sand within the 50-yr planning horizon (See Section 4.4). Current laws and regulations do not consider the export of large quantities of sand from natural streambeds. Therefore, there is a legislative and regulatory void on this issue. A large portion of the profits from sand mining operations are exported outside of the region; little of it remains to underpin the local economy. The frequency and weight of the trucks (30-40 ton weight) has negatively impacted the local transportation infrastructure (roads and bridges). The additional dust and noise caused by the trucks has negatively impacted the local population. Sand falling from the trucks during transport has affected vehicles and occupants traveling immediately behind them. El Barbon Wash is currently being sand mined, and the sand is exported outside of the valley to destinations in Southern California. A hydrologic and hydraulic study was undertaken to assess the extent, impact and sustainability of the sand-mining operations. The bed profile of El Barbon Wash, shown in Fig. 9, was obtained from existing topographic maps. El Barbon Wash has a steep slope, averaging 0.03 from point A to B, i.e., as it comes down from the Sierra Juarez (point A) to reach the entrance to the valley (at point B). Within the valley, the bed profile of El Barbon Wash has a slope averaging 0.00535, measured from point B to H, the latter located at the downstream point within the Ensenada sheet, close to the valley exit. Figure 10 features an image of El Barbon Wash and the Ojos Negros valley, showing the locations of points B to F (A is east of B; G and H are west of F). Fig. 10 Ojos Negros Valley and El Barbon Wash, showing sand-mining and soil-sampling locations. A field inspection undertaken on February 2002 showed that point C is the most upstream location of current sand-mining operations, and D is the most downstream location, for a total length of 1800 m of mined pit, measured along the streambed. The width of excavation was estimated to be about 250 m. The average depth of excavation was estimated at 2.3 m (Fig. 11). The total amount extracted to date is estimated to be about 1.04 million cubic meters. Current sand mining operations have a permit to mine an area of 2,530,217 m2 in the streambed, amounting to a length of 10 km and a width of 253 m. With an estimated final depth of 3 m, the total volume of extraction is 7,590,651 m3. Between points C and D, six samples for grain-size analysis were collected at four representative locations, shown in Fig. 10. Summary results of the grain-size analysis are shown in Table 1. Sample grain-size distributions are shown in Fig. 12. Fig. 11 Sand mining in El Barbon Wash, showing 2.3 m-depth of excavation (23 February 2002). Table 1. Summary of grain-size analysis, El Barbon Wash streambed samples. Sand originating in upland catchments of the Sierra Juarez is delivered to El Barbon Wash at point B (Fig. 10). Downstream of this location, the stream slope decreases abruptly, to 0.00535. This change in slope makes possible the deposition of a fraction of the sediments that are brought from the upland catchments. The quantity that is deposited depends on the hydrologic, hydraulic, and sedimentological properties of the catchment-stream-flood plain system. Estimates of sand deposition in El Barbon Wash, downstream of point B (Fig. 10), were accomplished using the hydraulic model MODELRIVER. This model was developed at San Diego State University following the U.S. Army Corps of Engineers' HEC-6 standard. To determine the flood discharges at point B (Fig. 11), 4-hr storm depths for frequencies of 2 to 50 yr were obtained from the "Isohyetas de Intensidad-Duración-Frecuencia, Republica Mexicana" (1990) (see Table 2, Column 2). The conversion to 24-hr storm depths was accomplished by assuming the 4-hr storm to be encompassed within the SCS 24-hr Type I storm. Other required hydrologic data (catchment area, hydraulic length, channel slope, and curve numbers) was obtained from Ponce et al. (1999). The flood hydrographs were calculated using the U.S. Army Corps of Engineers HEC-HMS. The peak discharges are shown in Table 2 and the corresponding flood hydrographs are shown in Fig. 13. Table 2. Flood hydrology characteristics of El Barbon Wash.
From point B to point F (Fig. 10), a study reach of 13,500 m was chosen for modeling purposes. This reach encompasses the current sand-mining operations, from point C to D, a length of 1800 m. The modeling was performed with cross sections every 100 m, for a total of 136 cross sections. Based on digital terrain modeling (DTM), the average channel width in the study reach was determined to be 240 m. Trapezoidal cross sections of 240-m bottom width and 2:1 side slopes were specified. At the upstream end of the study reach, a sediment-rating curve was developed using the Colby method (see Fig. 14). MODELRIVER was run for a hypothetical 50-yr flood series, assumming a suitable sequence of 2-, 5-, 10-, 25- and 50-yr floods. The results of the sediment routing computations are shown in Table 3.
from point B to point F (Fig. 9). The results shown in Table 3 are an approximation, because the actual flood series is not known a priori. Furthermore, the model does not account for the hysteresis in the sediment rating curve, the effect of which would be to increase the amount of sand deposition if the receding limb were to be longer than expected. This is certainly a possibility in El Barbon Wash, where recession times of flood hydrographs have been documented by eyewitness accounts to last days and even weeks. In view of the uncertainties inherent to sediment routing computations, it is judged appropriate to multiply the amount shown in Table 3 by a safety factor equal to 3. This would place the sand deposition in the study reach at 5.5 million m3 for the 50-yr planning horizon. This value can be compared with the 7.6 million m3 which is currently permitted for mining in El Barbon Wash. The stratigraphy of wells in El Barbon Wash shows alluvial materials. For reference, Fig. 15 shows the stratigraphy of three wells in corresponding parcels of the Ojos Negros valley. The Government of Mexico, through its various agencies that have jurisdiction on water resources and the environment, is currently developing an emergency norm (Norma Oficial Mexicana de Emergencia) to regulate the extraction of sand and rock from streambeds of rivers and washes. The norm stipulates the conditions that govern sand-mining operations in the entire country, with specific reference to the emergent situation in the state of Baja California (Fig. 17). In the past few years, sand mining for import to the United States has increased steadily, and the need has arisen to enact regulation to safeguard natural resources which could possibly be impacted by the mining operations. The natural streambed is that occupied by the maximum ordinary flood, assumed to be equivalent to the 5-yr flood for perennial streams and the 10-yr flood for ephemeral streams or washes. The federal stream zone consists of the natural streambed and the portion immediately adjacent to it, on both sides. For streambed widths greater than 5 m, the width of the federal zone, outside of the natural streambed, is 10 m on each side, measured horizontally; for streambed widths 5 m or less, the width of the federal zone is 5 m on each side, measured horizontally. After mining is complete, the edge of the pit should be graded to a 2.5:1 slope in the direction of the flow. During mining, the operator is required to maintain an undisturbed layer of 8-m minimum thickness for the protection of the aquifer. During mining, the operator is required to maintain an undisturbed unsaturated zone of 4-m minimum thickness for the protection of the aquifer. No paved roads are permitted within the natural streambed, and there is an upper limit to the size and weight of vehicles that are permitted on the streambed. In the case of Arroyo El Barbon, the requirement of the maintenance of an undisturbed unsaturated zone of 4-m minimum thickness appears excessive. Based on the grain-size analysis performed, the capillarity rise is estimated to be 0.5 m. In other sites, the capillarity rise will depend on the grain size; however, in sand-bed streams the capillarity rise should remain within 2 m.
Fig. 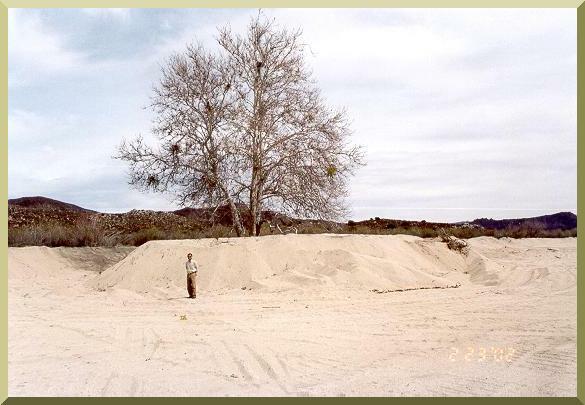 16 Sand mining in El Barbon Wash near Real del Castillo, Baja California (February 2002). 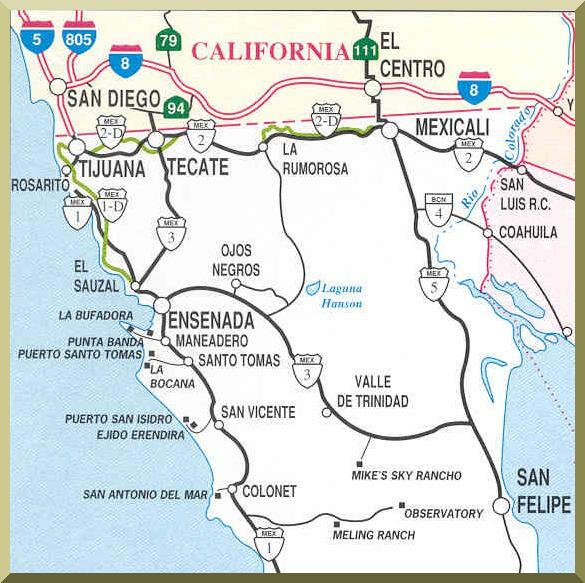 Noise pollution is regulated by the Municipality of Ensenada, which has jurisdiction over the Ojos Negros valley. The applicable legislation is the "Reglamento para el control de la calidad ambiental del municipio de Ensenada" (Law for the control of environmental quality in the municipality of Ensenada). Noise is defined as every sound that causes annoyance, interferes with sleep, work or rest, or that produces physical or psychological harm to the individual, flora, fauna, and public or private goods. The law specifies the permissible levels of noise pollution shown in Table 4. Sandmining operations are required to comply with this local regulation. Table 4. Permissible noise levels in the Municipality of Ensenada. Sand originating in the mountains of the Sierra Juarez is being deposited in El Barbon Wash, in the vicinity of the valley of Real del Castillo Viejo, in Baja California. Normal geologic accretion in this region is attributed to the valley slope (0.005) being much smaller than the mountain slope (0.030). The deposited sand fills the channel and creates a flood hazard to local property owners (ejidatarios). The deposited sand is high-quality construction-grade material and, therefore, marketable to potential customers elsewhere. Current environmental regulations in the United States have effectively discouraged sand-mining operators from continuing to mine streambeds in Southern California. In the meantime, the cost of sand has nearly doubled, setting the stage for import. In the past 6 years, the percentage of sand used in San Diego County and originating in Baja California has increased steadily, from close to zero to nearly 40% at present. El Barbon Wash has been sand-mined for about two years. The total volume of extraction to date (July 2002) is about 1 million m3; and mining continues. The operator has a permit to extract 7.6 million cubic meters of sand in a 10-km stream reach. The extracted material is being transported by trucks to Ensenada, where it is shipped in barges to destinations in Southern California. The sand is being used mostly as an aggregate for cement and asphaltic concrete. Sediment routing computations show that the amount of sand that is likely to be deposited in a 13.5-km reach, overlapping the current permitted reach, is 5.5 million cubic meters in a period of 50 years. Properly executed, sand mining will reduce flood hazard to local property owners (ejidatarios). 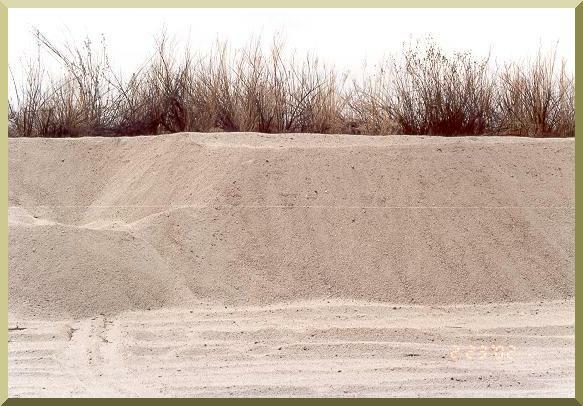 Properly executed, sand mining will have moderate environmental impacts, including impacts to groundwater, riparian habitat, noise and dust pollution, and landscape aesthetics. The socio-economic impacts of sand mining in El Barbon Wash are expected to be substantial. Issues yet-to-be-resolved in a satisfactory manner include the right of passage through private property, the effect on the local sand market and the local economy, and the effect on the transportation infrastructure. National emergent regulations for sand mining are currently being considered by the Mexican government. These regulations would require the maintenance of an undisturbed layer of a certain minimum thickness in the streambed, ostensibly for the protection of the aquifer. Enaction of this regulation should be followed by measurements in El Barbon Wash to verify compliance. The "coquillo" or nutsedge is found as a weed in cultivated fields in the Ojos Negros valley, in Baja California. It belongs to the genus Cyperus, of which about 900 species have been documented throughout the world. Some are grown for food, fibers, and perfume; others are considered among the world's worst weeds. Two species are found in the Ojos Negros valley: C. esculentus L. and C. rotundus L. Based on the color of their flowers, C. esculentus L. is commonly known as yellow nutsedge, and C. rotundus is known as purple nutsedge. The nutsedge belongs to the sedge family (Cyperaceae), and to the genus flatsedge (Cyperus L.). Its growth habit is graminoid, it is a perennial, apparently native to Eurasia, and it is introduced in the United States. The two most important species are: C. esculentus L. and C. rotundus L. Other common names are: nutsedge, nutgrass, cocosedge, cocograss, rednut sedge, coquito, and souchet rond. There are five botanical varieties of Cyperus esculentus: four wild varieties (esculentus, leptostachyus, macrostachyus, and hermanii) and one cultivated variety (sativus). This explains the existence of two groups of plants which have similar morphology and name, but differ in application: one is a weed and the other a crop. The nuts (tubers) of the yellow nutsedge are widely referred to as "chufa" nuts. Yellow nutsedge is known as chufa, yellow nutgrass, Northern nutgrass, nutsedge, earth almond, groundnut, tiger nut, zulu nut, rush nut, duck potato, or edible rush. Purple nutsedge is known by one of more common names in different places, including nutgrass, cocograss, "pakopako," "kili'o'opu," "chaguan humatag," "mustaka" or "musta" in Sanskrit, and "motha" in Hindustani. The plant is listed as a noxious weed by the U.S. federal government, and is considered a great menace to farmland in India. In Baja California, it is considered a nuisance in La Trinidad valley and in the Ojos Negros and Maneadero valleys. 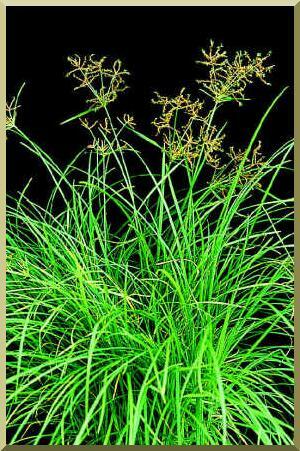 The use of yellow nutsedge has its origins in ancient Egypt. Chufa was one the first domesticated crops, having been found in vases in the tombs of the ancient Egyptian pharaohs. 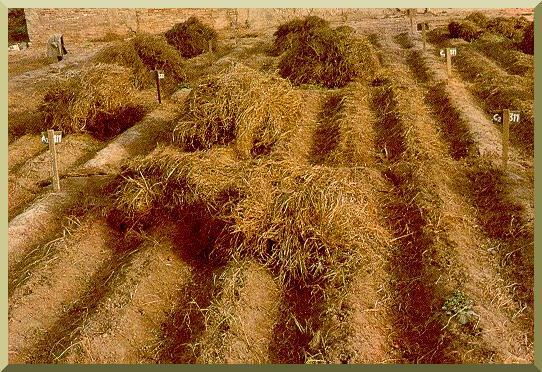 Chufa was widely used in Egypt and Sudan. Its dry tubers have been found in tombs from pre-dynastic times (4000 B.C.). The Arabs introduced the plant to Spain during the time of the Moorish kings (up to 1200 A.D.). The Eastern Spanish province of Valencia was the best for growing chufa. There are written records from the 13th century which mention the consumption of drink made from chufa (a predecessor to the horchata drink) in the region of Valencia. Yellow nutsedge occurs in most of the contiguous United States, where it now occurs in both natural and weedy habitats. In Canada, it was found primarily in native habitats prior to 1950. 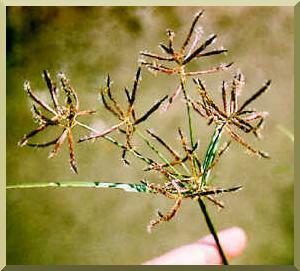 Over the last 40 years, yellow nutsedge has become weedy in cultivated fields. The spread of yellow nutsedge may correspond to the increased use of selective herbicides. Nutsedges develop an extensive system of rhizomes, tubers, and roots. 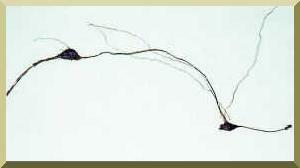 Rhizomes produce tubers and basal bulbs that bear aerial roots. 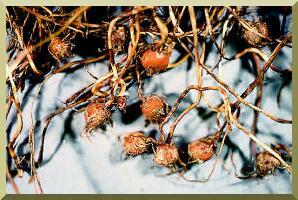 Tubers store starch and have several buds that produce rhizomes, which develop more basal bulbs and new plants. Roots often grow to greater depths than tubers or rhizomes. Rhizomes are slender, fleshy when young, and covered with scales. Nutsedges reproduce vegetatively from tubers and by seed. Tubers and seeds disperse with agricultural and nursery activities, soil movement, and in water, especially flooding. Seeds also disperse with wind. Seeds and tubers germinate in spring. Tubers develop to soil depths of approximately 32 cm, but most are in the top 20 cm. One plant can produce hundreds to thousands of tubers in one season. Seed production can be high, but viability is variable; in California, seed viability is typically low. One plant can develop into a dense colony 3 m or more in diameter. Patch boundaries can increase by more than 1 m per year. A single tuber can produce nearly 2000 plants and 7000 tubers in one growing season. 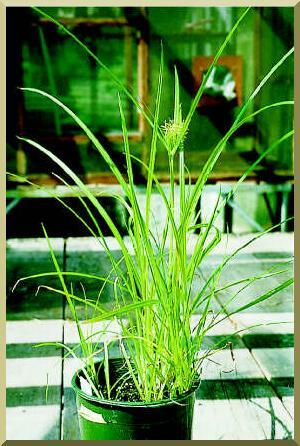 Very little nutsedge is produced from seed (less than 1 percent). Almost all of the nutsedge plants come from tubers that have been laying dormant in the soil or from tubers that have been brought in by contaminated sod, nursery stock, or machinery. Both nutsedges are able to survive in very diverse growing conditions. Nutsedges occur in disturbed areas, cultivated fields, especially those irrigated in the summer; in irrigation ditches, orchards, vineyards, gardens, turf, and landscaped areas. They grow typically where moisture is plentiful. They tolerate many soil conditions, including periods of drought and flooding. At present, yellow and purple nutsedge require different herbicides to control them; therefore, proper identification of the plants is vital. If the yellow nutsedge herbicide is used to control purple nutsedge, and vice versa, poor control of the targeted plants will result. There has been very little success controlling nutsedges using biocontrol methods such as fungi, insects, and nematodes. In turfgrass and ornamentals, mechanical control of the nutshedge is not feasible. At present there are four herbicides available for selective control of nutsedges in turfgrass: Basagran T/O, Daconate 6, Image and Pennant. In ornamentals, there are three herbicides available for the control of nutsedges: Basagran T/O, Pennant and Roundup. In turfgrass, Basagran T/O, Daconate 6, and immage are postemergence herbicides, while Pennant is used preemergence. Image and Daconate 6 are used for the selective control of purple nutsedge in most warm-season grasses. Image causes injury to cool-season grasses; at present there are no herbicides available for control of purple nutsedge in cool-season grasses. Basagran and Daconate6 are used for the selective control of yellow nutsedge in most cool-season grasses. In ornamentals both Basagran T/O and Roundup are applied postemergence, while Pennant is applied preemergence. Roundup, a broad spectrum herbicide, is used to control weeds such as nutsedges. Basagran T/O and Pennant are both used for the selective control of yellow netsedge in ornamentals. At present, there is no one herbicide available to control both nutsedges in all major turfgrasses. Since the nutsedges are not grasses, Fusilade/Venture, Past, Excel, or Assure will not be effective. This refers to the control of nutsedges by a hydrothermal process that utilizes the sun's energy to heat moist soil that is mulched under polyethylene. The basic concept of soil solarization is to use transparent, thermoplastic IR retentive films to allow transmission of light energy to the soil, where it is absorbed and used to heat the soil. Increased temperatures are achieved in this way. If the temperature under the plastic film and in the soil reaches sufficiently high temperatures, weeds, insects, and pathogens are damaged or killed. In arid cloud-free regions, the soil solarization technique has found wide application for the control of some soil-borne diseases and weeds. An experiment was performed in Western Australia to measure the effectiveness of soil solarization against fungi. Four weeks with soil temperatures at about 45oC where necessary to give good results against a certain fungi (Fusarium). If the temperature dropped below 45oC for 6-7 consecutive days, the treatment time had to be extended. Cloud cover had a marked effect on soil temperature under the plastic. With complete cloud cover and an air temperature of 34oC, soil temperatures of about 40oC were reached. 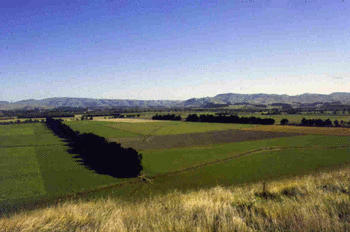 However, in a cloudless day with air temperature at only 24oC, soil temperatures approaching 50oC would be achieved. The fungus Dactylaria higginsii (Lutrell) M. B. Ellis has been identified by University of Florida researchers to control nutsedges. The method involves the use of the spores of the fungus applied to weeds to inhibit their growth or to induce mortality of the weed without adversely affecting the growth and yield of desired field crops. The fungus is very pathogenic to purple nutsedge. In certain parts of Tamil Nadu (Southern India), where rice is grown traditionally, farmers are effectively managing the nutsedge problem by using pigs. The pigs are of a local breed, dark black in color. They are allowed to collect the tubers in the wastelands. Since the tubers are succulent and sweet in taste, pigs are very fond of them. Nutsedge tubers are very nutritious food for pigs, increasing body weight and milk production. Pigs can easily remove the tubers even when the soil is hard. If the soil is wet and ploughed, it will be even easier for them to remove the tubers. Usually the field is soaked with water and puddled well when the animals are allowed to collect the tubers. Puddling will bring out the tubers buried in deeped layers (around 30 cm) and makes collection easier. Each animal can collect 2-4 kg of tubers in one day; 25-30 animals per acre (50-60 animals per hectare) can remove the available tubers within a day. Farmers around Virudhasalam village (Tamil Nadu) report that they practice this method every year before planting rice, and are able to control the nutsedge. In this way, purple nutsedge can be managed effectively without any harm to nature and without any additional weeding cost. Limit tuber production and drain tuber energy reserves by repeatedly removing small plants before the 6-leaf stage (every 2-3 weeks in summer). Mature tubers can resprout up to about 12 times. Shading or solarization can reduce infestations by weakening shoots and decreasing new tuber formation, but mature tubers may not be eliminated. Cultivation (of nutsedge) can worsen an infestation if not repeated often enough to exhaust tubers and prevent new tuber formation. For purple nutsedge, deep cultivate thoroughly (to about 30 cm deep) to fragment tuber chains and cover green parts, followed by persistent repeated cultivation (to about 15 cm deep) to kill new shoots and limit new tuber formation, especially when the soil is dry. Yellow nutsedge is found worldwide in warm and temperate zones, occurring in Europe and Africa. It was introduced into the New World from the Old World. In the Western Hemisphere, it grows from southern Canada to northern Argentina. The plant is known in most of the United States, except Wyoming and Montana (see map). It occurs elsewhere in the world in regions with temperate to tropical climates. Yellow nutsedge is a noxious weed of wet soil. The nutsedge is most difficult to control in cultivated soils, often forming a solid cover over large areas in cotton fields, sorghum and alfalfa pastures, flood plains, dams, ditches, and along streams and roadsides. In Arizona, it is common throughout most of the state, from 100 to 8200 ft elevation, flowering from May to November. In California it occurs throughout the state, up to elevations of 1000 m.
Yellow nutsedge generally occurs in disturbed habitats, but can tolerate a wide range of soils types. In natural habitats, the species grows along margins of lakes, rivers, streams, and marshes. These habitats are usually flooded in the spring, giving the nutsedge little competition from other plants early in the growing season. Yellow nutsedge also occurs as a weed in cultivated fields, where it is associated with a variety of other weeds. Although yellow nutsedge appears to compete poorly with other weeds, it is resistant to many herbicides. Therefore, it often increases rapidly when other weeds are controlled by herbicides. Yellow nutsedge is a tough erect fibrous-rooted perennial, 1 to 3 ft high, reproducing by seeds and by many deep, very slender rhizomes, which form weak runners above the ground, and small tubers or nutlets at the tips of underground stems. The tubers are dark, unevenly globed shaped, 3/8 to 3/4-inch long, and edible, tasting somewhat like almonds. Near the base of the triangular yellow-green stem, a cluster of three-ranked, grasslike leaves arises which are often longer than the stems, and 1/8 to 1/3-inch broad. The umbrella-like flowering tops have a few threadlike stems of different lengths radiating out like spokes from the stem tip. These have numerous yellowish to golden-brown spikelets on the upper part. The spikelets are very narrow, flattened, 1/16 to 1/12-inch broad, and 1/4 to 1 1/2-inch long. The leaves beneath the flowering tops are 2 to 10 inches or more long, and some are much longer than the flowering stems. The brownish three-angled achene, about 1/16-inch long, is widest at the top. The nutlets are almost smooth at maturity and unevenly globe shaped. Yellow nutsedge grows from perennial tuber-bearing rootstocks; the tubers are approximately 2/5 to 4/5-inch long. The leaves are narrow and grass-like, growing in three vertical rows on the stem. Most of the leaves are clustered at the base of the stem. The small flowers are yellowish or yellowish-brown, and arranged in narrow spikelets on umbel-like inflorescences (group of flowers originating from a single point). Located immediately below the inflorescence are 3- to 9-inch long leaf-like structures (bracts). The flowers have three stamens and a three-cleft style. The yellowish-brown seeds are about 1/16-inch long and three-angled. The yellow nutsedge plant forms tubers in the summer and autumn. The tubers, which are formed at the apical ends of indeterminate rhizomes, usually sprout the spring after they are formed. Tubers generally produce one to three sprouts (determinate rhizomes), which grow toward the soil surface and form a primary basal bulb just below the surface. Each primary basal bulb produces a vegetative plant. The basal bulb produced by the original tuber has many fibrous roots and indeterminate rhizomes; the indeterminate rhizomes may then develop into secondary basal bulbs and tubers. When a critical daylength or temperature is reached, plants stop growing vegetatively and start to flower; however, many populations do not produce viable seed. Tubers are the only part of the plant that overwinter. Winter conditions kill basal bulbs, rhizomes, fibrous roots, and all above-ground parts. While tubers may be viable up to 3.5 years, most only survive one winter. (University of Florida Cooperative Extension Service/IFS). Yellow nutsedge does produce seed; however, reproduction by seed is of minimal importance in most areas in comparison to vegetative spread. The species spreads primarily by tubers, rhizomes, and corn-like basal bulbs. Tubers planted to soil depths of 80 cm produced new plants. Tubers survive soil temperatures as cold as -5oC and require a period of chilling to break dormancy and germinate. Tubers germinate when soil temperatures remain above 6oC. Under field conditions, tubers typically survive approximately 3-4 years. Yellow nutsedge is considered one of the world's worst weeds. Well adapted to irrigated agriculture, yellow nutsedge is particularly problematic in row crops because it competes with crops for water, light, and nutrients, thereby reducing crop yield. It has also been known to spoil the quality of some crops. In some areas, yellow nutsedge tubers have been known to grow into potato tubers causing them to be graded as culls. They may also pass through shelled lima beans, requiring costly hand sorting. It addition, there has been some suggestion that this species may produce chemicals that are toxic to crops. Yellow nutsedge is closely related to chufa (Cyperus esculentus variety sativus); some taxonomists treat them as the same species. In parts of Africa, Europe and Asia, chufa is grown for its edible tubers. The tubers contain protein, carbohydrates, sugars, and lots of oil and fiber. The chufa nut is good for human health, containing high levels of iron and potassium, and no sodium. The Spanish produce a drink called "horchata" made out of the nuts (tubers) of the yellow nutsedge. The popularity of this drink has recently extended to other countries such as France, Great Britain, and Argentina. Chufa tubers are ground into flour, as well as being used to produce a cold drink (horchata), a coffee substitute, vegetable oil, and cellulose. In the United States, the primary use of chufa as a crop is to attract and feed game, particularly wild turkeys. Turkeys love chufa tubers; as natural scratchers, once discovering a plot of chufa, they will return again and again, all winter long, or until spring arrives and other food is readily available. Chufa tubers have been planted so that pigs could be turned into the fields to fatten and improve the taste of pork. In the United States, chufa tubers have been used as hog feed, pastured in the field in states such as Florida, Georgia, and Alabama. Tubers of chufa have also been identified as valuable food for waterfowl and cranes. Ducks dive for them when wetland fields are flooded. 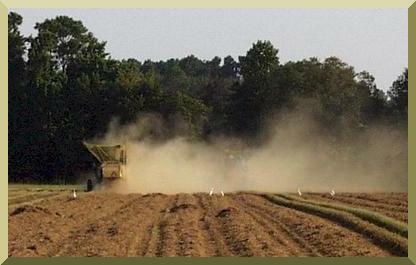 Chufa is also used in seed mixes for wetland restoration, mitigation, and erosion control. Currently, yellow nutsedge is merely regarded as another obnoxious weed; however, historically, its small tuberous rhizomes were used both as food and medicine by the Native Americans. Even today the Egyptians cultivate a native species of Cyperus in moist soils or sandy shores for their edible tubers. These are called "tiger nuts" and are first fried, and then soaked in water. Reportedly, the taste is similar to hazelnuts. It was another species (C. papyrus) that the Egyptians used to make paper, sails, cloth. mats, ropes, or plaited into sandals. In the Peruvian Amazon, reportedly there is a native species of Cyperus used widely by tribal women as a natural contraceptive. This property has been attributed to a certain mold that grows on the root of the Amazonian species that has oxytoxic (abortive) properties similar to Ergot, a fungus that grows on rye. In Maradi state, eastern Niger, C. esculentus is cultivated for export to Nigeria. Revenues from this weed exceed those from the typical cash crops such as cowpea and groundnut. 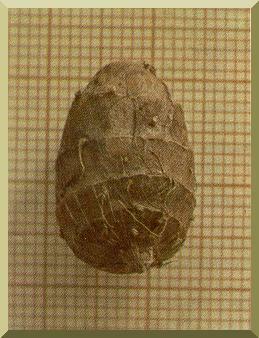 The tubers of C. esculentus may be consumed raw, roasted, or ground. Nowadays, chufa is cultivated in Northern Nigeria and Ghana, where it is made into a sweet meat, and Togo, where it is used uncooked as a side dish. These countries, and others as the Ivory Coast, export 2300 tons of tubers every year to Spain. The chufa is also a representative crop of the Spanish Mediterranean region, where tubers are used to make a beverage called horchata or horchata de chufas. The milky-looking aqueous extract of chufa has a pleasant and characteristic flavor of vanilla and almonds. Chufa is potentially a commercial source of high-oleic acid vegetable oil and high-carbohydrate tuber cakes. Some authors believe that tuber oil could be exploited in the same way as olive oil. Chinese researchers have measured the physical and fuel properties of oil extracted from the chufa, and concluded that the physical properties are similar to those of other vegetable oils. They have suggested that this oil may also be used as biodiesel fuel. Products from the chufa tubers include aqueous solutions (as a base for non-alcoholic beverages), milky solutions (as refreshing beverages or partial milk substitutes), as well as cookies and ice-cream made with chufa. The caramel from malted tubers of Cyperus esculentus may be used to add body, flavor, or color to certain baked products, non-alcoholic malt beverages and dark beers, and in the production of condiments. The starches obtained from chufa and rice showed similar properties; the solutions of the starch exhibited a good paste stability, clarity, and adhesive strength. The starch can be used in many starch-based foods as well as in the cosmetic industry, and for laundry, glazing and stiffening. The waste residue after oil extraction could be further modified producing syrups, flours, or livestock feeds. Chufa tubers have a relatively high total antioxidant capacity, because they contain considerable amounts of water-soluble flavonoid glycosides. Consumption of antioxidants could protect the immune system of malnourished populations. The intake of antioxidant-containing foods may delay the progression of HIV infection to AIDS. For many years, the chufa tubers have been considered to have adequate properties to fight respiratory infections, and some stomach illnesses. To this date, the "horchata de chufas" is considered an effective remedy for diarrhea, according to popular tradition in Valencia, Spain. Chufa is planted in late spring to midsummer by dropping the dried tubers 6-12 inches apart in rows spaced 2-3 feet apart. The planting rate is 15-40 pounds per acre. The tuber develops into a plant which has several tubers bunched together directly beneath it, the plant and a few straglers some distance away. 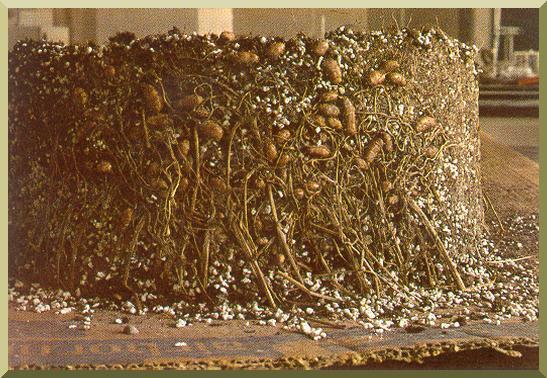 Although bunched together, each nut is attached to a thin underground stem that connects the single tuber to the growing shoot. Chufas are easy to grow and require almost the same care as corn. Experience in Northwest Florida suggests that chufa plots should be no less one acre, and preferably 2-5 acres. Very small plots may be damaged or destroyed by raccoons, crows, skunks, deer or squirrels. Raccoons, crows and skunks will dig up young plants to eat the tubers. Deer and squirrels will eat the tubers if they are exposed. Chufa may be planted in woodlands to encourage populations of wild turkey and deer. Planting time must allow 90-100 days frost-free growing time. In Northwest Florida, chufa is planted from April to early August. Earlier plantings seem to higher yield but require more cultivation or herbicide protection. Later plantings tend to last longer into the next winter, which is desirable. Chufas grow best in sandy-loam soils but will grow in the hardest clay. At the end of the planting season, when chufa tops have died down, a clumps should be turned over for the first-time turkeys to find. After they have located the plot, they will scratch it up and notify the next of kin, who will return to dig up and eat the tubers. 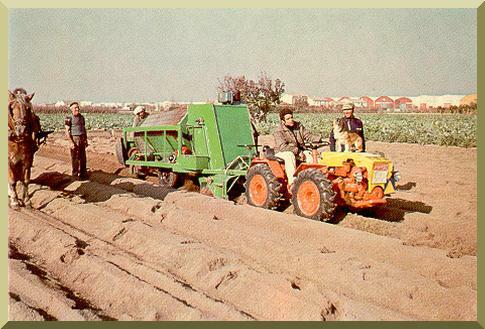 Since 1978, a number of research studies have been carried out related to the cultivation of chufa. The date of cultivation of chufa tubers has varied throughout time. Formerly tubers were usually planted at the beginning July, after the wheat harvest. Later, planting started in June and more recently, the first fortnight of May. In the early 1980s, most farmers preferred to plant tubers even earlier in the year to increase production. The influence of soil texture on the amount and quality of tubers has also been studied. The most appropriate soil texture for chufa cultivation is sandy-loam. The chemical control of yellow nutsedge is described in the following tables. It is best to target control efforts in the year before planting. 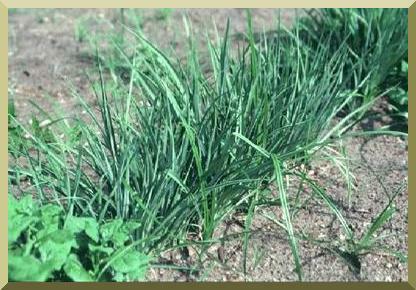 Use of a cereal crop or cover crop that shades the soil is recommended, as nutsedge does not tolerate shade very well. Rotation to a crop where Dual or Frontier can be incorporated before planting is recommended. The incorporation into the soil puts the herbicide down where the tuber will germinate from, inhibiting new shoots. Preliminary results show that a single top burndown at 30 to 45 days is not enough to prevent further tuber development. However, if topgrowth is controlled for a full year, tuber numbers will be reduced up to 90%. The farmer needs to look for opportunities to burn down the nutsedge before the nutlets begin to form in July. For late-planted crops, the tops should be destroyed before planting, or after an early harvested crop, the topgrowth should be destroyed immediately after harvest. In the non-crop period, Gramoxone, Ignite, or Roundup will kill tops. Basagran is also effective in killing tops. Nutsedge is usually dragged into a field on tillage equipment. Nutsedge moves into crop fields from edges near ditches and roadsides. New patches should be targeted before they get to be a problem. 1. Scientific name Cyperus esculentus L. Cyperus rotundus L.
Soil solarization is a simple, cheap, and highly efficient method to control weeds effectively. The only price input is the plastic sheets. To solarize the soil, first the soil must be in moist condition and covered with 0.125-mm thick black polyethylene or 0.1-mm thick transparent polyethylene sheet for 4 to 6 weeks. The sheet should be in a full stretched condition, and the edges buried in the soil to hold the sheet in place. Solar radiation heats the soil under the plastic sheets and the temperature rises to 45-50oC. The heavy heat affects the weed seeds present in the soil under the polyethylene cover. The effectiveness of the soil solarization depends on the exposure time and the prevailing temperature. 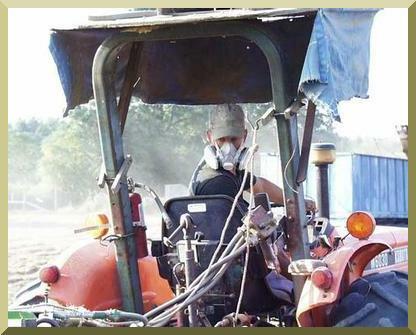 In addition to weed control, soil solarization controls plant diseases, and it alters some of the physical and chemical properties of the soil to promote better crop yield. Parts of the nutsedge, particularly the tubers of the yellow nutsedge, have been marketed as food for animals and even humans. Other parts of the purple nutsedge may also have economic uses. Additional research will determine whether this is a feasible control strategy for the Ojos Negros and neighboring valleys of Baja California. Ojos Negros valley, Baja California, Mexico. There is evidence that pigs can be used effectively to control coquillo. Pigs will search and eat the tubers, particularly those of the yellow nutsedge. Wildlife such as ducks and turkeys are also fond of the tubers of the yellow nutsedge. 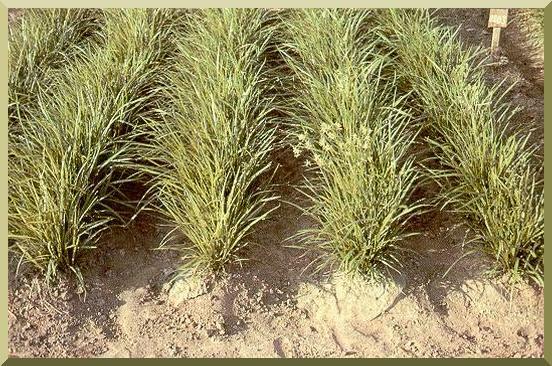 Research is needed to determine whether use of the nutsedge as animal feed is a feasible control strategy for the Ojos Negros and neighboring valleys of Baja California. The coquillo requires plenty of sunlight and water for its continued growth and development. One strategy for coquillo control that is being used in Ojos Negros is to rotate alfalfa into a coquillo-infested field. Alfalfa effectively shades the ground, inhibiting the coquillo aerial parts from growing. 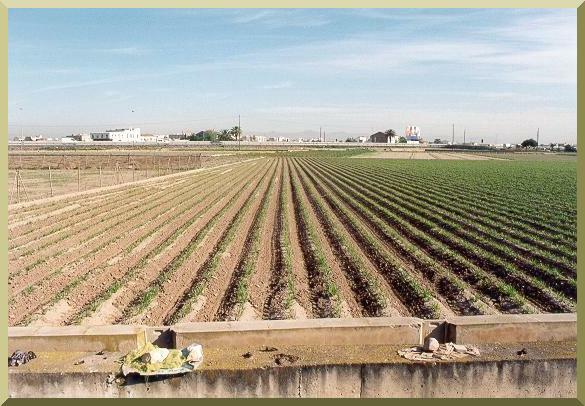 Control is effective while the alfalfa is being cultivated, although there is no experience to indicate that the coquillo will not come back after the field is rotated back to vegetables. 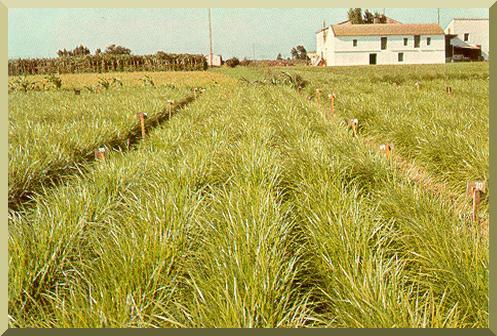 It is perhaps in Valencia, Spain, that the yellow nutsedge (C. esculentus L.) is best valued for the quality of its tubers. Researchers at the Universidad Politécnica de Valencia (Polytechnic University of Valencia) have studied the economic uses of C. esculentus since 1981. 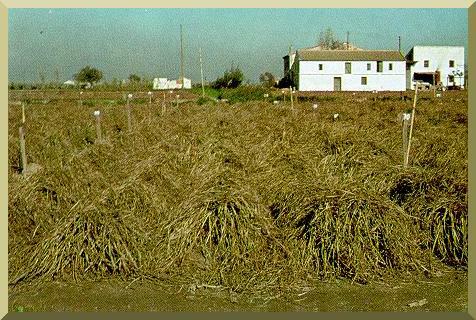 In particular, España and Maroto (1984) have published a book on the agronomy of the chufa (Cyperus esculentus L.). Their findings are reported here. the Polytechnic University of Valencia, Spain. The principal use of the chufa in Spain is as the main ingredient of the beverage called "horchata de chufas," which is common in Valencia. However, it is recognized that the chufa has other uses in other parts of the world, primarily as pig and wildlife feed. Great Britain and France import the tubers for the manufacture of sweets. The chufa tubers are very rich in carbohydrates and fats. Additionally, a very high-quality oil can be extracted from the tubers. This oil has been used in human consumption in Italy and Egypt. The chufa crop, although small compared to other popular staples, has increased steadily in Spain. The main reason appears to be the increase in the consumption of horchata, coupled with the increased profits associated with the mechanical collection of the tubers. The majority of the chufa grown in Spain is in Valencia. The chufa is grown during the spring, since its aerial parts are very much affected by cold weather. The sprouting of tubers requires a temperature of at least 12oC. The chufa is adapted to sandy and silty-sandy soils; it does not do well in clayey soils. One tuber can produce from 25 to 150 plants (Vaya, 1981). In one instance, one tuber produced 1900 plants and 6900 tubers, all within an area of 2.1 m diameter and 0.23 m depth (Tumbleson and Kommendahl, 1961). 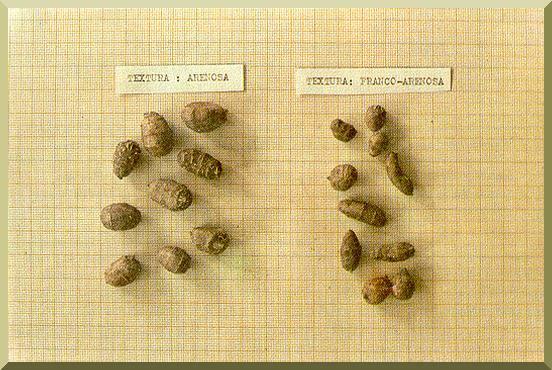 The Valencian growers distinguish two types of chufa tubers: "Ametlla," of rounded tubers, and "Largueta," of elongated tubers. Planting is done at the beginning of May, and sometimes as early as April. The number of water applications varies with the local rainfall, from between 10 to 15 per crop. The watering interval is one month during the spring and one week during the summer. "Ametlla" type, in Valencia, Spain. "Llargueta" type, in Valencia, Spain. The chufa plants are better adapted to cultivation in soils of sandy and silty-sandy texture. In clayey soils, the tubers are of thicker skin, less pleasingtaste, and feature a greater number of roots. Fertilization studies of chufa has been accomplished with positive results. The Valencian study used two types of liquid fertilizers, and concluded that the chufa responds adequately to target fertilization. Fertilization increased the number and quantity of tubers, and the size of the aerial parts. General aspect of the C. esculentus crop in the middle of July, Valencia, Spain. "Bedding" is a mechanical or physiological accident which consists of the bending of the aerial parts from nearly vertical to nearly horizontal. Late bedding usually starts in August, when the plants have grown considerably. Prolonged bedding interrupts photosynthesis, and the plants turn brownish in color and start to wilt. Late bedding is normal; however, early bedding, which occurs around July, has the effect of lowering productivity. It appears that agronomic practices that delay bedding, either late or early, have the net effect of increasing tuber productivity. In general, chufa is not fertilized because of the rotation with other crops, among which are potatoes and artichokes, which are fertilized. 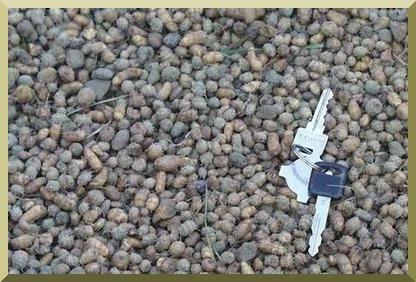 While there is no rule for chufa fertilization, there is a belief that too much nitrogen could lead to excessive aerial growth and intensify bedding, at the cost of reduced tuber productivity. Nitrogenous fertilizers have shown to reduce the dry weight of tubers, as compared to fertilization with non-nitrogenous fertilizers. A C. esculentus crop subject to "bedding," in Valencia, Spain. Coquillo plants that have bedded and wilted at the end of the planting season. Tuber collection is performed during the second half of November and the first half of December, although it may extend until January. The aerial components of the plant are usually burned. Tuber collection used to be accomplished manually, but nowadays it is done by mechanical means. General aspect of the manual collection of tubers of C. Esculentus, Valencia, Spain. Manual collection consists of a revolving hopper with a screen that separates soil and other impurities, leaving the tubers almost clean, ready for the wash. Mechanical collection is accomplished with a tractor that pulls two bodies; the first body collects the soil, transporting it to a sloping and rotating cylindrical hopper, where the tubers are separated from the soil, and collected at the end of the cylinder. grown in a 10-cm peat-perlite substrate, Valencia, Spain. After collection, the chufas are washed to eliminate rocks, earth, and other impurities. The chufas are bagged and allowed to dry for about 4-6 hours. Production varies between 15 and 18 metric tons per hectare, when the tubers are weighted 4-6 hours after washing, and in rare occasions, it can reach 22 metric tons per hectare. Dry weight is about 60% of the initial weight. and before tuber collection, Valencia, Spain. Studies at Valencia have shown that the substrate texture has a bearing on the type of tubers that are likely to develop in a chufa crop. 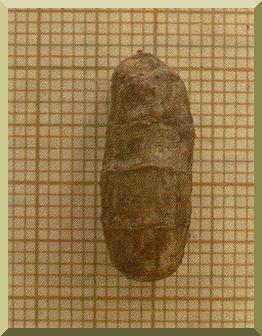 Sandy substrates produces tubers of larger size than those produced in other substrates. However, there is little difference on the total weight of tubers under various types of susbtrates. sandy at left and silty-sand at right (Valencia, Spain). Pascual, B., J. V. Maroto, S. López-Galarza, A. Sanbautista, and J. Alagarda (2000). "Chufa ( Cyperus esculentus L. var. Sativus Boeck. ): An Unconventional crop. Studies related to applications and cultivation." Economic Botony, 54(4), 439-448. Pascual España, B. and J. V. Maroto Borrego (1984). "Estudios Agronómicos realizados en el cultivo de la chufa (Cyperus esculentus L.). Patronato Provincial de Capacitación Agraria, Diputación Provincial de Valencia, España (Spain). The botanical description corresponds to the species Cyperus esculentus collected in the valleys of Ojos Negros, Maneadero and La Trinidad. The description of Cyperus rotundus is not included because the field samples did not show differences, being all Cyperus esculentus. The genus Cyperus esculentus is an annual or perennial with flowers of various arrangements, frequently in compound inflorescences sustained by bracts resembling leaves. Its plants generally have rizomes, the plants are not dioic (with both sexes in the same plant), perfect flowers, stems generally rooted from the base of the inflorescence, even though in contact with the soil; rizomes with presence of tubers, fruits of 1.5 to 1.8 mm of length, of brown-grayish color, shiny; thin scales, reddish, acute; the tubers of more than 1 cm diameter. The height of this plant in the region is from 30 to 60 cm. Yellow nutsedge is found close to arroyos and channels, and its flowering is from June to October. 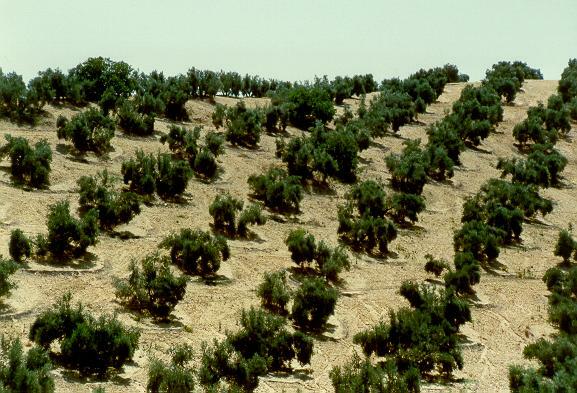 In the northwestern region of Baja California, it is known as "coquillo," which competes with high-yield irrigated crops. It is considered a weed, and is subject to control with herbicides with little success. The following table shows a list of agricultural producers (ejidatarios) in the Ojos Negros valley, whose parcels are affected with the coquillo weed. 1 Data from year 2001. Location of coquillo-affected parcels in the Ojos Negros valley, Baja California. The infestation of the Ojos Negros valley with coquillo is moderate to severe. The extent of the infestation in affected parcels is estimated to vary from 10 to 30 percent. Typically, some infested parcels have dense patches of coquillo, while in others the infestation is distributed more-or-less uniformly throughout. Yellow nutsedge tends to be the predominant species, although purple nutsedge is also present. The existence of coquillo appears to be related to the practice of renting the land to the agricultural companies, particularly for the cultivation of green onions. The weed established itself in the valley about 6-10 years ago, at about the same time as the rental practice began. 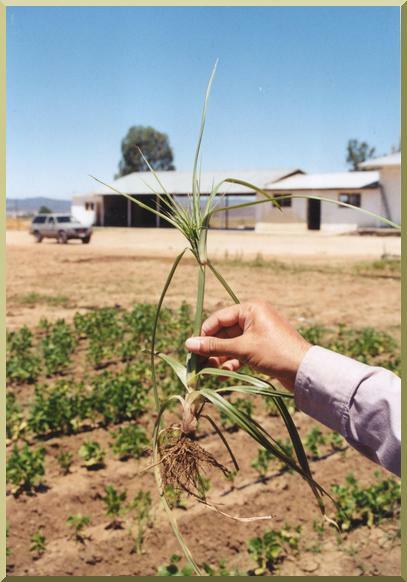 The coquillo weed infests irrigated parcels which grow vegetables. These crops are grown in rows, watered heavily, and do not shade the ground. These conditions favor the development of coquillo. The presence of coquillo is related to irrigation; where there is no irrigation, there is no coquillo. The infested parcels tend to be adjacent to the packing plants. These plants pack the products of the neighboring parcels for export. 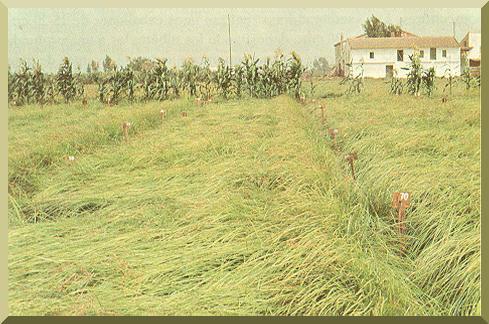 The rotation to alfalfa and other tall grasses shades the coquillo, inhibiting its growth and providing weed control. A sample of Cyperus esculentus was taken to the UABC Laboratory of Animal Nutrition in Mexicali for a bromatological analysis. The results are shown in the following table. 1 Laboratorio de Nutrición Animal, UABC Mexicali (02 August 2002). The research has determined that the coquillo is a weed that thrives in irrigated lands such as those of the Ojos Negros valley, in sandy soils, and that it is a crop which is difficult to kill by mechanical or chemical means. The research has also revealed a potential for a positive use of the coquillo tubers as food for animals and humans. The tubers have been effectively used as pig feed, and for feeding wildlife such as cranes and wild turkeys. An alternative use of the yellow nutsedge, which holds promise for the Ojos Negros valley, is the marketing of the coquillo tubers for the preparation of the horchata drink ("horchata de chufas"). This will require a change in the local attitude toward coquillo, from a weed to a beneficial plant. Research is needed to explore the possibility of applying this concept in the Ojos Negros valley, and in neighboring valleys such as the Maneadero valley, near Ensenada, and the Trinidad valley. The extent of the coquillo infestation in these valleys appears to be greater than in the Ojos Negros valley. In June 2002, the affected producers (listed in section 6.1) were interviewed to gather their perceptions on the causes, extent, and strategies to deal with the coquillo problem. Thirteen interviews were conducted with owners (ejidatarios) and renters. A summary of the responses is given below. Most affected producers attribute the presence of coquillo to land or machinery rental; some point out that the coquillo has been brought in with seed mix for pasture. There appears to be a strong link between the presence of coquillo and the cultivation of green onions (cebollin). Propagation is aided by the sharing of equipment and dispersion by animals (birds or groundhogs). Vegetable crops are most affected by coquillo; these include green onions, onions, hot peppers, tomatillo, beans, watermelon, melon, and pumpkin. Among the affected crops, the green onion shows the greatest vulnerability, competing very poorly with the coquillo. Taller and denser crops such as alfalfa, wheat, tall grass and prairie grass are not as vulnerable because they tend to shade the coquillo, inhibiting its growth. Farmers who have rented their fields to the agricultural companies (Agroindustrias Vigor, Estrella Nueva, Agricola el Sol and Agricola el Toro) have reported coquillo infestations in the years following the rental period. The companies are shying away from continuing to rent infested parcels. The coquillo has been recognized as a problem in the valley for the past 6 years, but some have mentioned longer periods, up to 16 years. Most people interviewed agree that the extent of coquillo infestation has been increasing, while consistently being fought with cultural practices and other means, including mechanical and chemical. In general, the affected producers are not aware of the type of coquillo, although the evidence suggests that the yellow nutsedge predominates over the purple nutsedge. The extent of the infestation varies from moderate to severe, typically ranging from 10% to 30% of aerial coverage. In some fields, the infestation appears in dense patches, while in others it covers most of the field with low density. One particular parcel close to a packing plant was severely infested, with the coquillo seen in patches as well as distributed throughout the land. In two cases the infestation was minimal, being restricted to small areas. The affected producers have tried to control the coquillo in many ways. Some have used herbicides like Bueno 6, Dual, Gramopol and Sempra, but these herbicides provide a temporary solution and do not eliminate the tuber. The herbicides tend to kill only the aerial part of the coquillo and are expensive and inefficient. Nonetheless, the majority of the producers will keep using this strategy for lack of a better alternative. A solution that has been tried is to rest the field for one year or more in an attempt to kill the tuber. Manual and mechanical removal of the aerial parts is a common way to attack the coquillo, but it increases the cost of operation, reducing profits. Infested parcels are being weeded mechanically to discourage and eliminate competition with the planted crop. A novel approach consists of removing a depth of soil, say 30-50 cm, when the infested area is new and of limited extent; the extracted soil is quarantined and the field is then leveled for cultivation. Little if any support has been forthcoming from the various levels of government to control the coquillo weed. The use of pigs to dig out and eat the tubers has been recognized, but there are some drawbacks, including the unsanitary conditions and the practicality of the procedure; two of the producers interviewed recognized this alternative as a solution. Solarization is expensive, it has not been tried, and there is no experience with it. The affected producers were suprised when told that the coquillo is grown commercially in other parts of the world. Reactions ranged from positive to negative. A few farmers wholeheartedly supported the concept of growing coquillo as a crop, if further research clarified its feasibility and if the economic benefits could be clearly defined. Other farmers tended to regard the coquillo more as a menace than anything else, and were reluctant to consider it as a crop. More research is recommended on this issue. The Ojos Negros valley is infested with the coquillo weed. 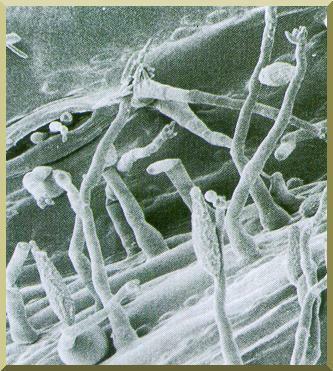 The infestation is moderate to severe, with 11 affected parcels, and the extent of infestation varying from 10 to 30 percent, often in patches. Yellow nutsedge (Cyperus esculentus L.) predominates over purple nutsedge (Cyperus rotundus L.) as the primary species. The presence of coquillo in the valley appears to correlate well with the presence of the green onion crop and the associated practice of renting the land to the agricultural companies. Both crop and weed established themselves in the valley at about the same time, 6 to 10 yr ago. Coquillo likes plenty of sunlight and water. Shading inhibits the growth of coquillo; irrigation favors the development of coquillo. Coquillo is difficult to control by mechanical or chemical means. The tubers can grow to depths up to 1 m, making it next to impossible to dispose by mechanical extraction. Selective harvest of the aerial parts will not control the coquillo, because the tubers will hide underground and resprout when water becomes available. Coquillo can be controlled by cultural means, e.g., by rotation to a taller plant such as alfalfa, or by resting the land for a few years. Coquillo can also be temporarily controlled by weeding, although at a high cost to the farmer. Coquillo may also be controlled by alternative means such as soil solarization and feed for pigs, and it may be grown commercially for use as food for wildlife, particularly wild turkes and cranes. 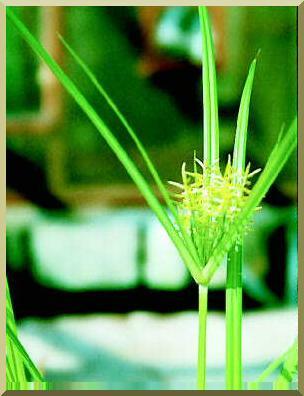 The yellow nutsedge of the Sativus variety is used in other parts of the world as food for humans. The variety is successfully cultivated in Valencia, Spain, and other selected regions such as Egypt, Italy, and Argentina. Particularly, the tubers are grounded and used in the production of a beverage called horchata de chufas, which has a pleasant flavor of vanilla and almonds. Other uses for the tubers such as for ice cream and coffee and chocolate substitutes have been documented. The cultivation of coquillo in the Ojos Negros valley holds promise. This is also true in the case of the neighboring valleys of Baja California, particularly Maneadero and Trinidad, where the coquillo infestation is judged to be presently more severe than in Ojos Negros. The tubers can be marketed for use in the preparation of horchata and for other economic uses, following established practice in other parts of the world. The cultivation of coquillo will require a change of perception on the part of farmers, government officials, and other actors, to regard the coquillo less as a weed and more as a crop from which economic benefit can be obtained. Additional research in this area is highly recommended, due to its potential for sustainability. Drought is a weather-related natural disaster. It affects vast regions for months or years. It has an impact on food production and it reduces life expectancy and the economic performance of large regions or entire countries. Drought is a recurrent feature of the climate. It occurs in virtually all climatic zones, and its characteristics vary significantly among regions. Drought differs from aridity in that drought is temporary; aridity is a permanent characteristic of regions with low rainfall. Drought is an insidious hazard of nature. It is related to a deficiency of precipitation over an extended period of time, usually for a season or more. This deficiency results in a water shortage for some activity, group, or environmental sector. Drought is also related to the timing of precipitation. Other climatic factors such as high temperature, high wind, and low relative humidity are often associated with drought. Drought is more than a physical phenomenon or natural event. Its impact results from the relation between a natural event and demands on the water supply, and it is often exacerbated by human activities. The experience from droughts has underscored the vulnerability of human societies to this natural hazard. Drought definitions are of two types: (1) conceptual, and (2) operational. Conceptual definitions help understand the meaning of drought and its effects. For example, drought is a protracted period of deficient precipitation which causes extensive damage to crops, resulting in loss of yield. Operational definitions help identify the drought's beginning, end, and degree of severity. To determine the beginning of drought, operational definitions specify the degree of departure from the precipitation average over some time period. This is usually accomplished by comparing the current situation with the historical average. The threshold identified as the beginning of a drought (e.g., 75% of average precipitation over a specified time period) is usually established somewhat arbitrarily. An operational definition for agriculture may compare daily precipitation to evapotranspiration to determine the rate of soil-moisture depletion, and express these relationships in terms of drought effects on plant behavior. Operational definitions are used to analyze drought frequency, severity, and duration for a given historical period. Such definitions, however, require weather data on hourly, daily, monthly, or other time scales and, possibly, impact data (e.g., crop yield). A climatology of drought for a given region provides a greater understanding of its characteristics and the probability of recurrence at various levels of severity. Information of this type is beneficial in the formulation of mitigation strategies. The various types of droughts are listed below. Meteorological drought is defined on the basis of the degree of dryness, in comparison to a normal or average amount, and the duration of the dry period. Definitions of meteorological drought must be region-specific, since the atmospheric conditions that result in deficiencies of precipitation are highly region-specific. United States (1942): Less than 2.5 mm of rainfall in 48 hours. Great Britain (1936): Fifteen consecutive days with daily precipitation less than 0.25 mm. Libya (1964): When annual rainfall is less than 180 mm. Bali (1964): A period of six days without rain. Agricultural drought links various characteristics of meteorological drought to agricultural impacts, focusing on precipitation shortages, differences between actual and potential evapotranspiration, soil-water deficits, reduced groundwater or reservoir levels, and so on. Plant water demand depends on prevailing weather conditions, biological characteristics of the specific plant, its stage of growth, and the physical and biological properties of the soil. A good definition of agricultural drought should account for the susceptibility of crops during different stages of crop development. Deficient topsoil moisture at planting may hinder germination, leading to low plant populations per hectare and a reduction of yield. Data sets required to assess agricultural drought are soil texture, fertility and soil moisture, crop type and area, crop water requirements, pests and climate. Data sets required to assess hydrological drought are surface-water area and volume, surface runoff, streamflow measurements, infiltration, water-table fluctuations, and aquifer parameters. Socioeconomic definitions of drought associate the supply and demand of some economic good with elements of meteorological, hydrological, and agricultural drought. It differs from the other types of drought in that its occurrence depends on the processes of supply and demand. The supply of many economic goods,such as water, forage, food grains, fish, and hydroelectric power, depends on the weather. Due to the natural variability of climate, water supply is amplein some years, but insufficient to meet human and environmental needs in other years. Socioeconomic drought occurs when the demand for an economic good exceeds the supply as a result of a weather-related shortfall in water supply. The drought may result in significantly reduced hydroelectric power production because power plants were dependent on streamflow rather than storage for power generation. Reducing hydroelectric power production may require the government to convert to more expensive petroleum alternatives, and to commit to stringent energy conservation measures to meet its power needs. The demand for economic goods is increasing as a result of population growth and economic development. The supply may also increase because of improved production efficiency, technology, or the construction of reservoirs. When both supply and demand increase, the critical factor is their relative rate of change. Socioeconomic drought is promoted when the demand for water for economic activities far exceeds the supply. Data sets required to assess socioeconomic drought are human and animal population and growth rate, water and fodder requirements, severity of crop failure, and industry type and water requirements. The characteristics of droughts are expressed in terms of: (1) drought index, (2) intensity-duration-frequency. A drought index assimilates thousands of data on rainfall, snowpack, streamflow and other water-supply indicators into a comprehensible picture. A drought index is typically a single number, far more useful than raw data for decision making. There are several indices that measure how much precipitation for a given period of time has deviated from historically established norms. Some indices are better suited than others for certain uses. For example, the Palmer Drought Severity Index (PDSI) has been widely used by the U.S. Department of Agriculture to determine when to grant emergency drought assistance. The PDSI is better suited for large areas with uniform topography. Western states, with mountainous terrain and the resulting complex regional microclimates, find it useful to supplement the PDSI with other indices such as the Surface Water Supply Index (SWSI), which takes snowpack and other unique conditions into account. The National Drought Mitigation Center is using a new index, the Standardized Precipitation Index (SPI), to monitor moisture-supply conditions. The distinguishing features of this index are that it identifies emerging droughts months sooner than the Palmer Index, and that it is computed on various time scales. Most water-supply planners find it useful to evaluate one or more indices before making a decision. Important drought indices used in the United States and elsewhere (Australia) are detailed below. The percent of normal precipitation is the ratio of actual to normal precipitation for a given location and a given period, expressed as a percentage. Analyses using the percent of normal are effective when used for a single region and a single season. In other applications, the index can vary depending on the choice of period, including monthly, seasonal, or annual. The Standardized Precipitation Index (SPI) was developed in the understanding that a certain deficit of precipitation has different impacts on the soil moisture, ground water, reservoir storage, snowpack, and streamflow. The SPI was designed to quantify the precipitation deficit for multiple time scales. These time scales reflect the impact of drought on the availability of the various types of water resources. Soil moisture conditions respond to precipitation anomalies on a relatively short scale, while ground water, streamflow, and reservoir storage reflect long-term precipitation anomalies. For these reasons, the SPI was originally calculated for 3-, 6-,12-, 24-, and 48-month time periods. The SPI is an index based on the precipitation record for a location and chosen period (months or years). The record is fitted to a probability distribution which is then transformed into a normal distribution so that the mean SPI for the location and period is zero. The index is negative for drought and positive for non-drought conditions. Table 1 shows a classification system linking SPI's with drought intensities. A drought event occurs any time the SPI is continuously negative and reaches an intensity less than or equal to -1.0. The event ends when the SPI becomes positive. Each drought event has a duration defined by its beginning and end, and an intensity for each month that the event lasts. The sum of the SPI's for all the months within a drought event is the drought magnitude. In 1965, Palmer developed an index to measure the departure of the moisture supply. Palmer based his index on the supply-and-demand concept of the water-balance equation, taking into account the precipitation deficit. The objective of the Palmer Drought Severity Index (PDSI) is to provide standardized measurements of moisture conditions, so that comparisons can be made between locations and between durations. The PDSI is a meteorological drought index that is responsive to abnormal weather conditions, either on the dry or wet side. For example, when conditions change from dry to normal or wet, the drought measured by the PDSI ends without taking into account streamflow, lake and reservoir levels, and other long-term hydrological aspects. The PDSI is calculated based on precipitation and temperature data, as well as the local Available Water Content (AWC) of the soil. From the inputs, all the basic terms of the water balance equation can be determined, including evapotranspiration, soil recharge, runoff, and moisture loss from the surface layer. Human impacts on the water balance, such as irrigation, are not considered. Palmer developed the PDSI to include the duration of a drought or a wet spell. An abnormally wet month in the middle of a long-term drought should not have a major impact on the index, or a series of months with near-normal precipitation following a serious drought does not mean that the drought is over. Therefore, Palmer developed criteria for determining when a drought or a wet spell begins and ends, and to adjust the PDSI accordingly. In near-real time, Palmer's index is no longer a meteorological index but becomes a hydrological index, properly referred to as the Palmer Hydrological Drought Index (PHDI). This index is based on moisture inflow (precipitation), outflow, and storage, and does not take into account the long-term trend. The Surface Water Supply Index (SWSI) complements the Palmer Index for moisture condition. The Palmer Index is basically a soil-moisture algorithm calibrated for relatively homogeneous regions. It is not designed for large topographic variations across a region and it does not account for snow accumulation and subsequent runoff. The SWSI was designed to be an indicator of surface water conditions, including mountain snowpack. The objective of the SWSI is to incorporate both hydrological and climatological features into a single index resembling the Palmer Index, and applicable to major river basins. The SWSI values are standardized to allow comparisons between basins. Four inputs are required: snowpack, streamflow, precipitation, and reservoir storage. The SWSI is dependent on the season; therefore, it is computed with only the snowpack, precipitation, and reservoir storage in the winter. During the summer months, streamflow replaces snowpack as a component of the SWSI. The procedure to determine the SWSI for a particular basin is as follows. Monthly data are collected and summed up for all precipitation stations, reservoirs, snowpack and streamflow measuring stations across the basin. Each summed component is normalized using a frequency analysis gathered from a long-term data set. The probability of nonexceedence is determined for each component based on the frequency analysis. This allows comparisons of the probabilities between the components. Each component has a weight assigned to it depending on its typical contribution to the surface water within that basin. These weighted components are summed to determine a SWSI value representing the entire basin. Like the Palmer Index, the SWSI is centered on zero and has a range between -4.2 and +4.2. The Reclamation Drought Index (RDI) was developed as a tool for defining drought severity and duration, and for predicting the beginning and end of a drought period. As with the SWSI, the RDI is calculated at a river basin level. It incorporates the supply components of precipitation, snowpack, streamflow, and reservoir levels. The RDI differs from the SWSI in that it builds a temperature-based demand component and a duration into the index. The RDI is adaptable to each particular region and its main strength is its ability to account for both climate and water supply factors. As shown in Table 3, the RDI values and severity designations are similar to the SPI, PDSI, and SWSI. Another drought-monitoring technique consists of arranging the monthly precipitation data into deciles. This technique was developed to avoid some of the weaknesses of the "percent-of-normal" approach. The technique divides the distribution of occurrences over a long-term precipitation record into tenths of the distribution. Each of these categories is a "decile." The first decile is the rainfall amount not exceeded by the lowest 10% of the precipitation occurrences. The second decile is the precipitation amount not exceeded by the lowest 20% of occurrences. These deciles continue until the rainfall amount identified by the tenth decile is the largest precipitation amount within the long-term record. By definition, the fifth decile is the median, and it is the precipitation amount not exceeded by 50% of the occurrences over the period of record. The deciles are grouped into five classifications. The relations between drought intensity, duration and frequency can be studied with conceptual models, which deal with meteorological droughts lasting at least one year, with specific applicability to subtropical and midlatitudinal regions. The climate types are defined across the climatic spectrum in terms of the ratio of mean annual precipitation to annual global terrestrial precipitation Pma / Pagt , and additionally, on the ratio of annual potential evapotranspiration to mean annual precipitation Eap / Pma . To complete the description, the length of rainy season Lrs across the climatic spectrum is also indicated. For any year with precipitation P, drought intensity is defined as the ratio of the deficit (Pma - P) to the mean (Pma) . For drought events longer than one year, intensity is the summation of the annual intensities. The conceptual model of drought intensity-duration-frequency is shown in Table 5. Response includes improved drought monitoring, better water and crop management, augmentation of water supplies with groundwater, increased public awarenessand education, intensified watershed and local planning, reduction in water demand, and water conservation. Fig. 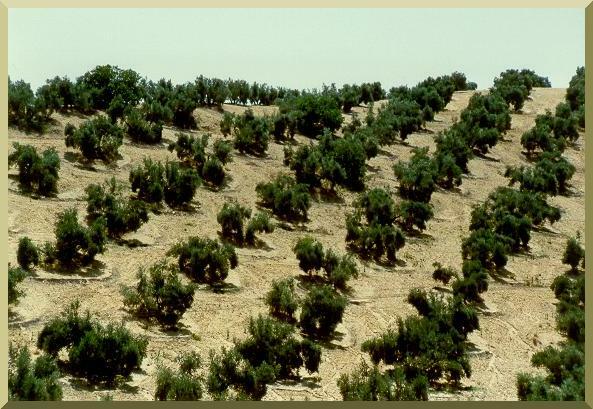 3 Olive grove in Andalucia, Spain, showing saucer basins to contain precipitation. The Ojos Negros valley is located in the state of Baja California, Mexico, approximately 40 km east of Ensenada, along the Mexico 3 highway (Fig. 4). The valley has an arid climate, with rainy season in the winter (November to April) and extreme temperature variability. Agriculture and animal husbandry are the primary economic activities in the valley. The valley has approximately 3100 ha under irrigation and about 5000 head of cattle. Irrigated agriculture is supported by groundwater; however, a sizable portion of the total cultivated area is operated by dryland farming, and consequently, it is subject to droughts. Droughts are a recurrent feature of the landscape, primarily affecting the dryland farming and related animal-husbandry operations. The climatological records for ten (10) stations located in Baja California, in the vicinity of the Ojos Negros valley, were analyzed to establish drought intensity-duration-frequency relations. The results of the analysis are shown in Table 6. While the average drought intensity for all stations is 0.83 (moderate), the intensity at Ojos Negros is 1.23 (severe). This shows that drought intensity is likely to be severe in the immediate vicinity of the Ojos Negros valley, while remaining moderate for the rest of the study region. When the data is taken all together, 48% of the drought events are moderate (intensity less than 0.625), 34% are severe (intensity between 0.625 and 1.25), and 18% are extreme (intensity greater than 1.25). Average drought duration is 2 yr at Ojos Negros, and 2.46 yr for the region. Average drought frequency is 3.54 yr at Ojos Negros, and 3.96 yr for the region. It is concluded that droughts in the Ojos Negros valley and vicinity are likely to be moderate to severe, to recur every 4 yr, and to last about 2 yr. In principle, herd numbers should be related to the climate. The local climate is subject to variability, and the dry periods (droughts) may last more than one year. In the Ojos Negros valley in particular, drought is likely to be moderate to severe, last 2 yr, and recur every 4 yr. Therefore, ranchers must consider this climatic constraint when planning the size of their herds. In general, herds should expand during periods of wet weather, and contract during drought periods. Forecasting the climate on an annual basis is the responsibility of the national water agency. During a drought, the herd manager should evaluate the members of the herd to eliminate the inefficient individuals. The herd size should be reduced to a number that can be supported by the available resources. The physical attributes of the individual animals should be evaluated critically. Animals with bad physical attributes or diminished reproduction ability should be considered for culling. The replacement heifer crop should be critically evaluated. In a drought year, the minimum number of heifers should be retained, and the rest should be sold. Bull should be evaluated to select those that are getting old and in need of replacement. Old bulls should be eliminated during drought years, and replaced as soon as practicable. All cattle are affected by a host of internal and external parasites. Cattle under nutritional and heat stress are less resistant to parasites than under normal conditions. Strategic deworming during a drought will relieve some of the nutritional stress on the animals. Heifers and calves are not able to compete with mature cattle for pasture or supplemental feed. Drought feed is costly and it is important to feed only those animals who really need it. Segregating animals gives each class a better chance of getting needed feed supplies. Vulnerable classes can be segregated and given preferential treatment. The older dry cows can be moved to the poorer forage fields. Contract grazing or renting pasture is another drought strategy. However, the cost of hauling or renting the pasture should not be more than the cost of purchasing feed. Use of a drought-affected paddock can be optimized by providing local water facilities and supplemental hand feeding. Water retention and detention structures capture storm-water runoff which can be used for a variety of purposes, including groundwater recharge, irrigation, and drinking water for livestock. Windbreaks and shelterbelts help in reducing wind velocity and, therefore, evaporation and evapotranspiration, aiding in coping with drought. Rainwater harvesting can be accomplished for immediate or eventual use in irrigation or drinking water for livestock. Landscape contouring and terracing can be implemented where feasible to reduce runoff and direct excess moisture into areas planted with trees, shrubs, and grass. During June 2002, several interviews were performed with local cattle ranchers. The interviews sought to collect perceptions about drought, drought characteristics, and drought mitigation, to serve as a basis for the development of policy. Most people interviewed said that rain appears to have have been steadily decreasing. Some ranchers observed that in the 1950's it rained all-year round and the pastures were always green. Since the 1970's, drought appears to have intensified. Rain was plentiful in 1978, 1981, 1992 and 1998. In other years, rain has been limited, and some years have not had any rain. Ranchers do not consult outside sources (i.e., weather agencies) to learn whether is it going to rain or not. They feel reluctant to ask these sources because they feel they could be wrong. The ranchers agree that there is a recurrence interval between the drought years and the rainy years, but the periodicity of the cycle is unknown. Some say the rainy periods last from 4 to 7 yr, while the drought periods last from 2 to 4 yr. Yet others believe that drought recurs every 4 yr on the average. Furthermore, there are those that believe that even years are rainy while odd years are dry. During drought years, there is not enough moisture for normal dryland pasture growth. Irrigation is an option for those that can rely on groundwater, and this is typically the case of Ojos Negros; but those ranchers which have no wells or small wells are significantly affected by drought. Herd reduction to 50% or less is a common strategy to cope with drought. Some ranchers move their cattle to rented land, while others are forced to purchase hay to feed their lot. The last resort is to undersell the herd, with consequent loss of profitability. When selecting the cattle to be sold or removed, farmers usually go first for the older animals, then they separate the newborn herd to reduce competition for food. Other drought related effects are fires, erosion and groundwater depletion. The Comisión Nacional del Agua (National Water Commission) has supplied farmers with statistical facts, seminars and some additional help. SAGARPA and other government agencies have subsidized the shipping of hay from Mexicali to Ojos Negros during droughts. Retention walls, or structures such as dykes or dams, as well as natural obstructions to runoff are yet to be used to retain precious water during drought. Water reservoirs are an option, but water would be retained only for a limited amount of time. Most ranchers believe that it is important to ration the water supply; otherwise, the valley is going to eventually lose its economic potential. Droughts are a recurrent feature of the climate, varying in intensity, duration, and frequency across the climatic spectrum. A drought can have substantial economic, environmental, and social impacts. The Ojos Negros valley, in Baja California, Mexico, has an arid climate and is, therefore, subject to frequent droughts. Agriculture and animal husbandry are the primary economic activities in the valley. Irrigated agriculture is entirely supported by groundwater, while animal husbandry is accomplished primarily by dryland farming. Drought intensity varies from severe in the Ojos Negros valley to moderate across the region. 48% of the drought events in the region are classified as moderate; 34% as severe; and 18% as extreme. Drought duration varies from 2 yr in the Ojos Negros valley to 2.44 yr in the region. Drought frequency varies from 3.54 yr in the Ojos Negros valley to 3.96 yr in the region. The analysis shows that droughts in the Ojos Negros region are likely to be moderate, to last 2 yr, and to recur every 4 yr on the average. Planning for drought mitigation should take these characteristics into account. Appropriate herd management in Ojos Negros can help reduce the impact of drought. The members of the herd should be evaluated to eliminate those that are less useful. Planning for herd size should consider the periodicity of drought. A program of soil-and-water conservation is needed in the Ojos Negros valley to help cope with recurrent droughts. Farmers should save water during protracted drought periods to ensure sustainability of the water resource.